Kepler power. 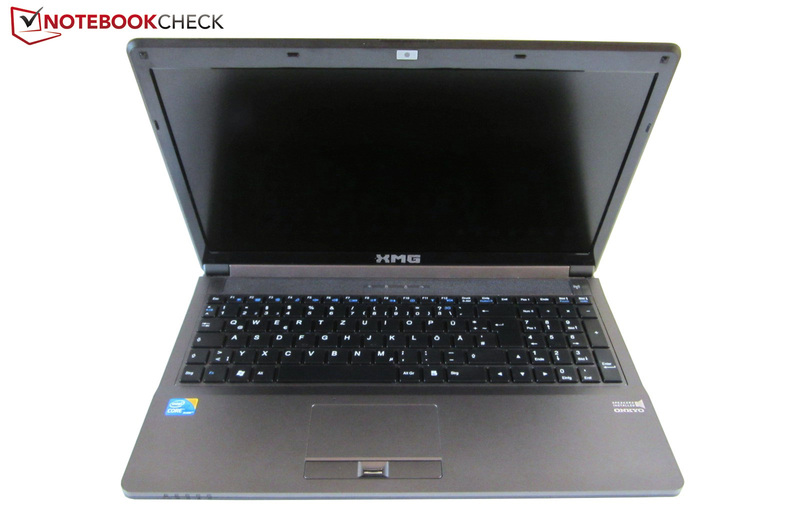 The 15-inch Schenker XMG A522 is specifically designed for price-conscious gamers. The Nvidia GeForce GTX 660M GPU, based on the latest 28 nm Kepler architecture, offers the perfect balance between performance and energy efficiency. Thanks to Optimus technology, the battery life should also be significant. In this review, we consider whether this notebook is a good, well-rounded package. 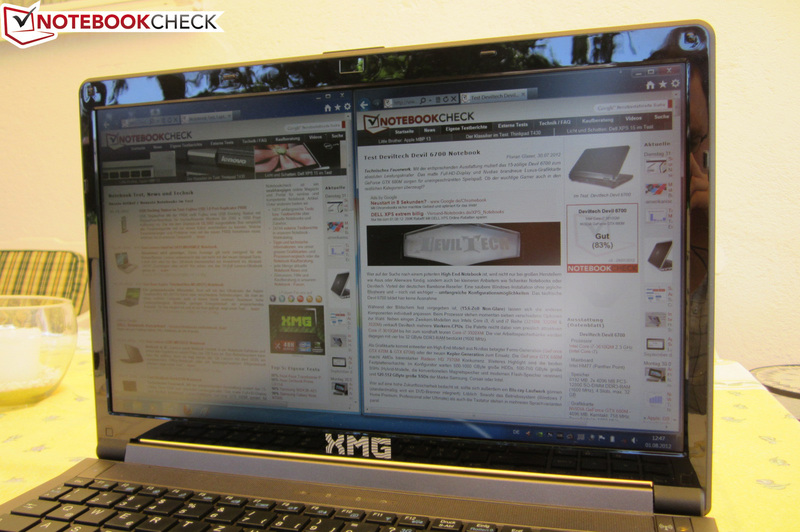 With its latest model, the 15-inch XMG A522, German notebook expert Schenker attempts to close the gap between the attractively priced but exceedingly mid-range XMG A502 and the powerful but expensive XMG P502. While the low-end model features the GeForce GT 650M, a fairly good GPU by most standards, the top-of-the-line P502 gives buyers the choice of either the wickedly expensive GeForce GTX 680M or the just-as-fast Radeon HD 7970M. By comparison, the GeForce GTX 660M in our sample XMG A522 is geared toward users who want high-end graphical processing power without breaking the 1000 Euro (~ $1220) barrier. As is generally the case with Schenker notebooks, the XMG A522 is easily configurable using the robust online configurator. Almost every component can be customized prior to purchase using this tool. 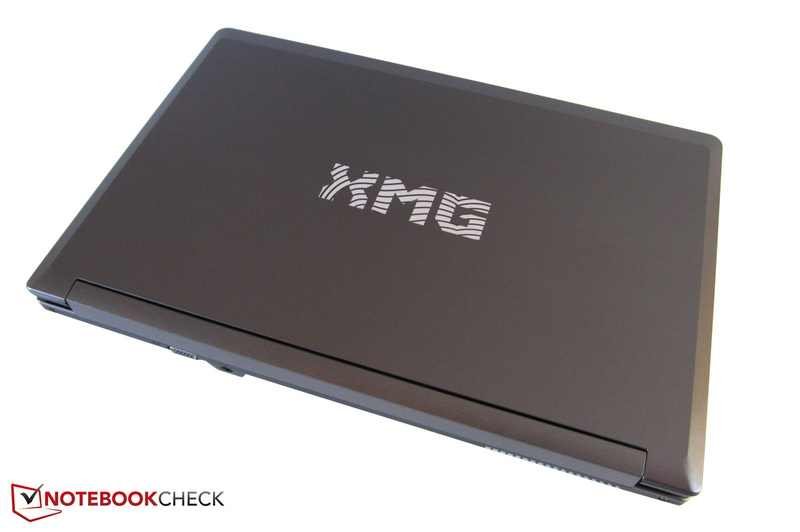 One of the most difficult decisions in choosing the XMG A522 is the display. The matte, non-glare screen is available in both the 1600x900 HD+ resolution and the 1920x1080 Full HD resolution. 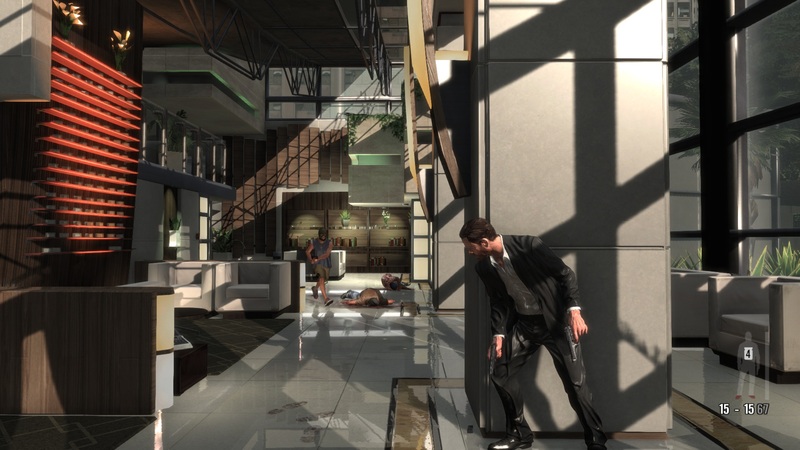 While the Full HD resolution provides a generous desktop, the graphics card becomes more heavily burdened during gaming. The relatively-high pixel density also requires a certain period of familiarization. This Full HD resolution is generally better suited for the 17-inch class of notebooks. After choosing the display, the potential buyer is then confronted with an even larger selection of processors. The standard Core i3-3110M can be replaced with 35-Watt TDP dual-core processors and 45-Watt TDP quad-core models. The energy-efficient Core i7-3612QM is also available. All processor options belong to the Ivy Bridge family of processors as denoted by the Core i 3000 series model numbers. A maximum memory capacity of 24 GB DDR3 RAM is available, pointing toward a rather unusual configuration of memory slots. Similarly, the options for storage devices are equally vast. 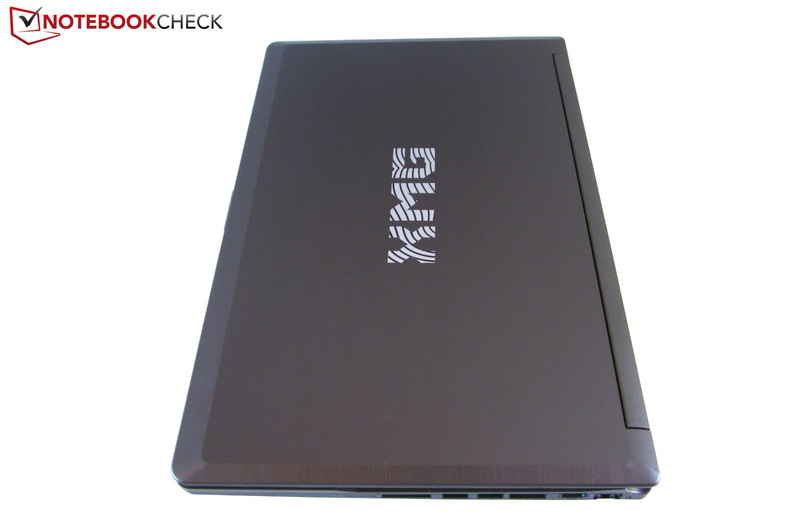 The customer is free to choose from physical hard disks ranging in size from 320 to 1000 GB, hybrid drives (SSHs) between 500 and 750 GB, and pure solid state drives (SSDs) between 60 and 600 GB for the two 2.5-inch slots. 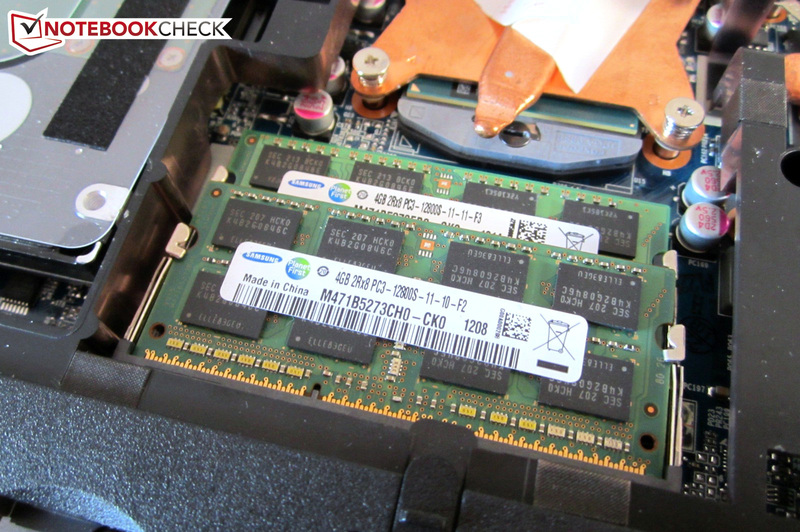 For a notebook of this class, we would recommend either the 128 GB or 256 GB Samsung SSD 830 for the operating system based on their good price-per-performance ratios. 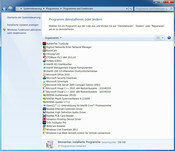 While on the subject of operating system, the user is free to choose the 64-bit versions of Windows 7 Home Premium, Windows 7 Professional, and Windows 7 Ultimate. For the optical drive, the user can choose between a DVD writer, a combination DVD writer and Blu-Ray player, or a Blu-Ray writer. For the Wi-Fi module, the user can choose between an Intel Centrino wireless card and a Qualcomm Atheros Killer model. One additionally nice option is the keyboard which is available in German, French, Swedish/Finish, British English, and American English formats. The 819 Euro (~ $999) base price only covers the most basic, low-end configuration. Realistically, the XMG A522 will cost between 1000 and 1300 Euro (~ $1220 and $1590) based on hardware and operating system configuration. 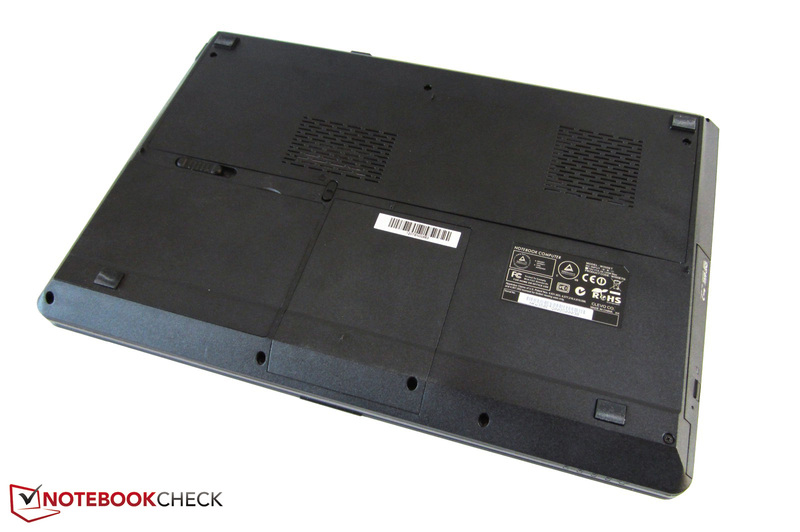 For the case, Schenker uses the 15-inch W350ET barebones system from Taiwanese manufacturer Clevo. This case is the smaller brother of the 17-inch W370ET case used in the One K73-2O and XMG A722. The smaller 15-inch W350ET shares the 44-millimeter (1.7-inch) thickness of the larger W370ET, but the other dimensions are reduced from 413 x 278 millimeters (16.3 x 10.9 inches) to 374 x 250 millimeters (14.7 x 9.8 inches). Both barebones systems use the same color. The gray, lightly-textured plastic lid resembles brushed aluminum and Clevo applied a light rubberized coating to the wrist rest. With a weight of 2.8 kilograms (6.2 pounds), the weight is approximately 400 grams (0.9 pounds) lighter than the W370ET barebones system which also features two hard drive slots. The 15-inch case differs from the 17-inch case by using a high-gloss display bezel rather than the matte bezel found in the W370ET, a change we consider annoying. Fingerprints are readily visible on the bezel and even careful cleaning cannot prevent the inevitable accumulation of micro-scratches. The W350ET demonstrated decent overall stability. Other than the speaker bar and vent grilles, the base unit barely yielded to higher selective pressure. The only area that could have been a bit more rigid was the display lid. We found that the case creaks a bit depending on where pressure was applied to the case. Unfortunately, vibrations and movement of the work surface led to teetering in the display lid. As well, the base unit lifted partially when the display was opened. 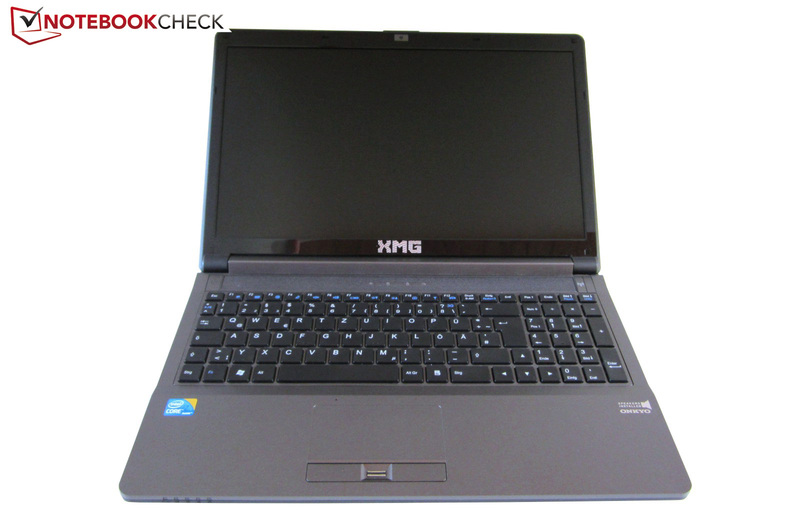 Nonetheless, we are satisfied with the XMG A522’s overall quality. Workmanship and materials provided an impression that was nearly beyond reproach. By comparison, the 15-inch MSI MS-16GA barebones system found in the DevilTech Fire DTX and the MSI MS-16F3 found in the DevilTech Devil 6700 make a somewhat cheaper impression despite their fancier facades. 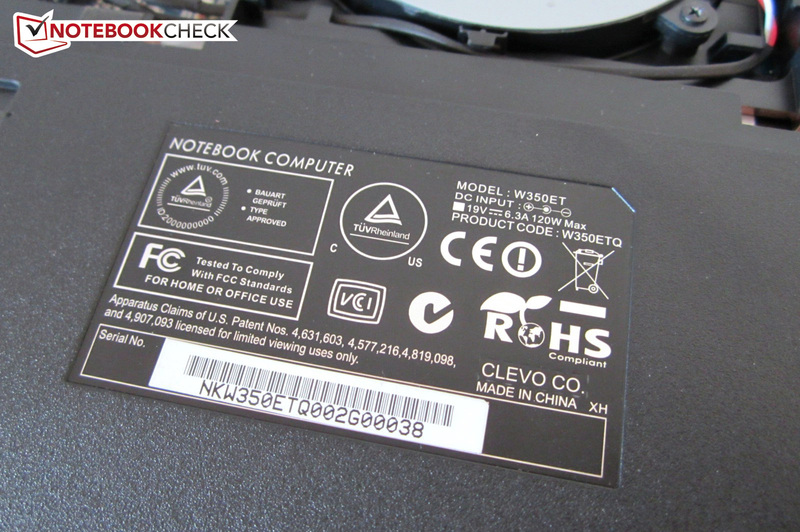 Clevo uses a mostly plain case design and the XMG logo on the display lid merely consists of three stickers. As expected, the Schenker XMG A522, based on the W350ET barebones system, uses the same interfaces that are found on the W370ET barebones system. While the front houses only a few status LEDs, the rear edge provides power connector and a VGA port. 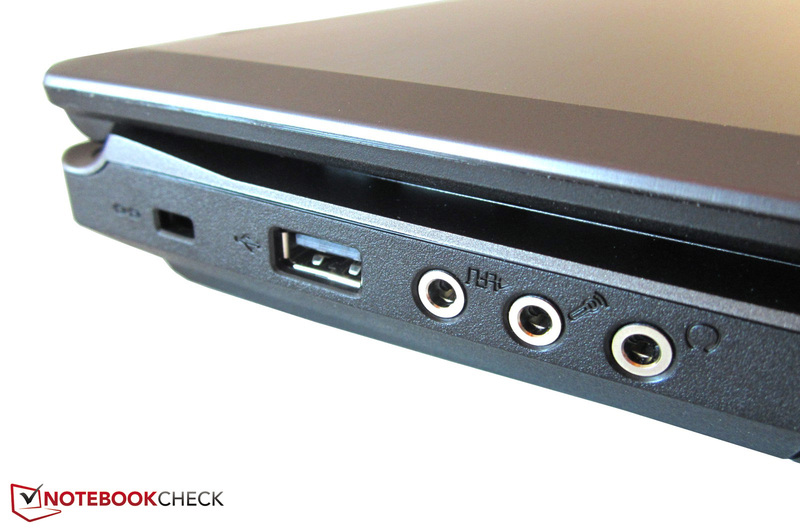 The left side offers connectivity in the form of a Kensington lock slot, a USB 2.0 port, and three audio jacks for headphones, microphones, and S/PDIF. On the right side, the Clevo barebones system is generous in providing two USB 3.0 ports, an eSATA/USB 3.0 combination port, a 9-in-1 card reader, HDMI output with support for the 1.4a specification, and an RJ45 Gigabit LAN port. Due to the “tail-heavy” positioning of the ports, use of an external mouse should not be a problem and cable routing should be easy to maintain. The only possible effect an abundance of cables might have on use is a slight obstruction of elbow space laterally. 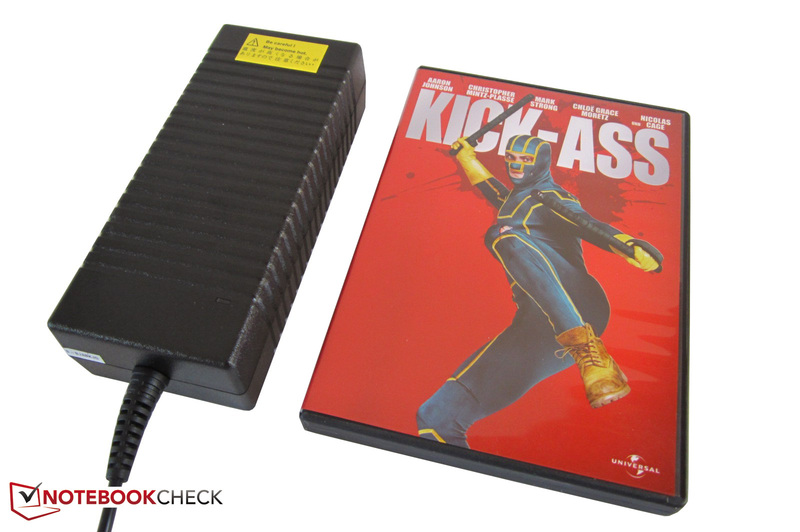 Our test XMG A522 came with the Qualcomm Atheros Bigfoot Killer Wireless-N 1102 network adapter. The half-sized mini PCIe module features two antennas and supports the 802.11a/b/g/n Wi-Fi standards, including Wi-Fi Direct. According to the manufacturer, this module is capable of transmission rates of up to 300 Mbit/s in the 2.4 and 5.0 GHz frequency bands. The manufacturer also claims that the card is specifically optimized to prioritize latency sensitive data packages and is thus particularly suitable for gamers. Unfortunately, this module does not include Bluetooth support. 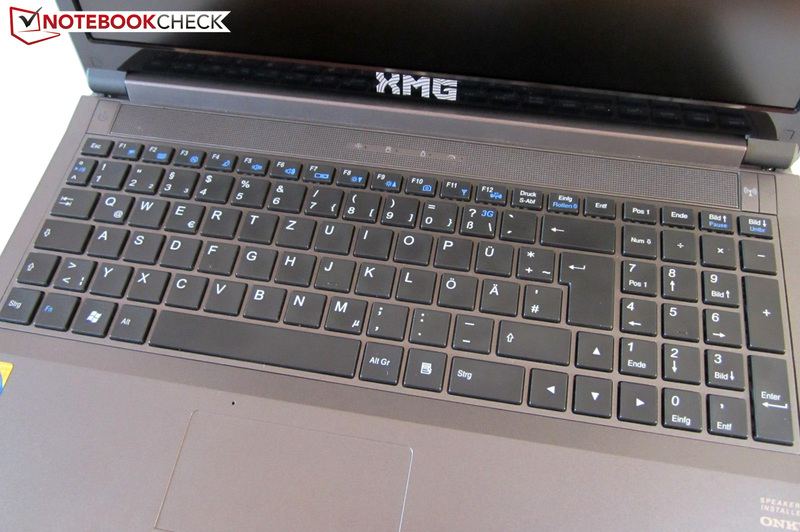 The XMG A522 also features a fingerprint reader, a microphone above the touchpad, and an HD webcam. The XMG A522 has two maintenance covers on the underside. These covers can be easily pushed aside after removing several screws and allow substantial access to the internal components. Two RAM banks and both hard disk slots are directly accessible as are a fan and the cooling system. The heat pipes for the replaceable CPU and non-replaceable GPU connect to a common heat sink. Maintenance on this device, such as installing a storage device or cleaning the fan, is easy even for less-experienced users. 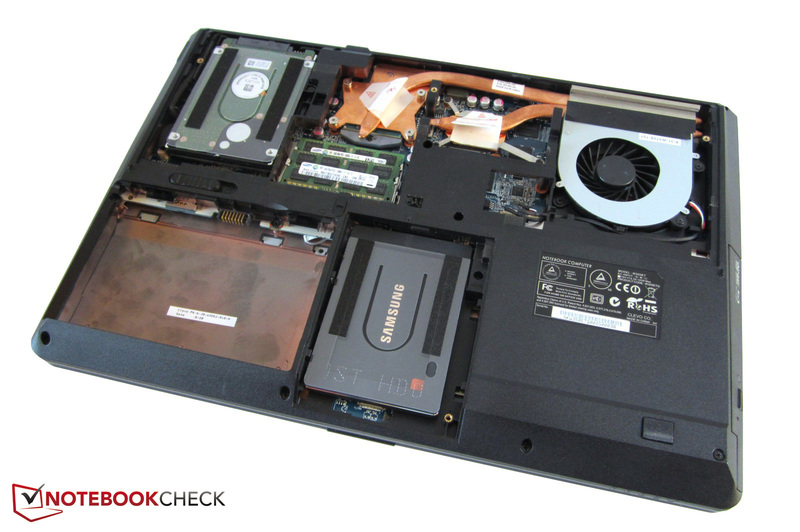 Accessing the third RAM bank and UMTS slot are a bit more complicated as they are located underneath the keyboard which must first be unscrewed after levering out the speaker grille. This process is illustrated in our photographs. 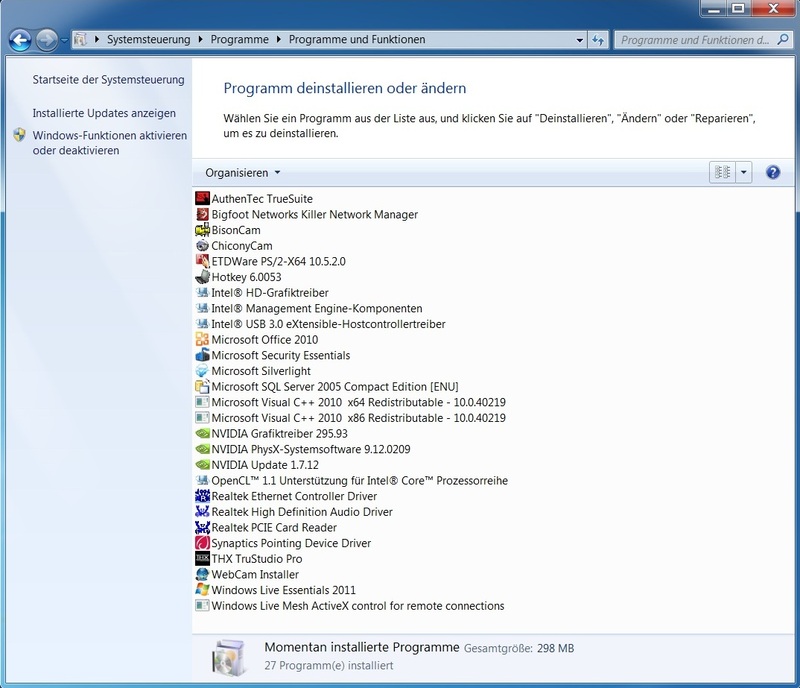 For the XMG A522, Schenker installed only the required component drivers and a few hardware-related tools such as the informative Bigfoot Killer Network Manager. As a result of omitting superfluous bloatware, we observed a very responsive operating system. Theoretically, it is not necessary to download or buy a word processing program or a virus scanner as Microsoft Security Essentials and Office 2010 Starter Edition are pre-loaded. Clevo’s exclusive Control Center also combines various convenience functions and operating modes into a single interface. Apart from the power supply and battery, Schenker only includes a driver and tool DVD in the retail packaging. The standard warranty includes two-year pick-up and return service as well as instant-repair for several months. Outside of Germany, this warranty only includes the typical carry-in service. Other warranty options are available at the time of purchase. A three-year warranty increases the cost by 100 Euro (~ $122) and a four-year warranty adds a 200 Euro (~ $245) premium to the device. 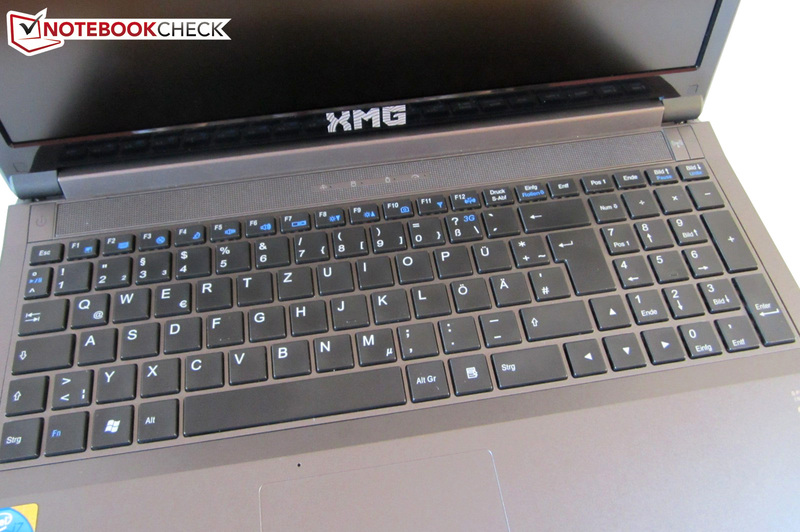 As with the weaker Schenker XMG A502, the XMG A522 does not feature a backlit keyboard. 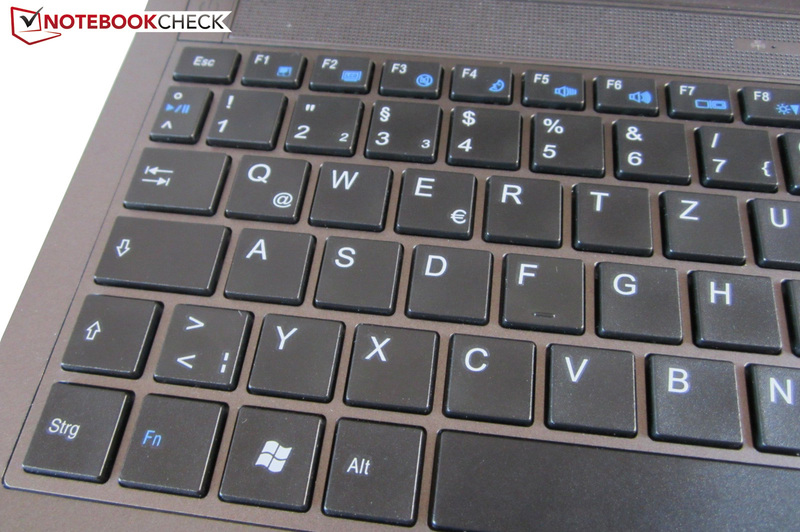 While both chiclet-style keyboards appear similar at first glance, a detailed inspection reveals differences. For example, the 15 x 15 millimeter (0.59 x 0.59 inch) keys are a bit bigger and more angular than the 14 x 14 millimeter (0.55 x 0.55 inch) keys of the XMG A502. As well, the dedicated number pad has four rows instead of three. As Clevo uses full-sized arrow keys, their layout may not appeal to everyone. The right arrow key is part of the number pad and the number pad “0” key is only half as wide as usual. Otherwise, the keyboard layout complies with the standard. The keyboard demonstrates a viable typing feel due to the hard surface, good pressure point, and decent stroke. As is typical for Clevo, the input sounds slightly clattery. This also applies to the rather loud mouse keys. A handful of clever special functions must be highlighted. 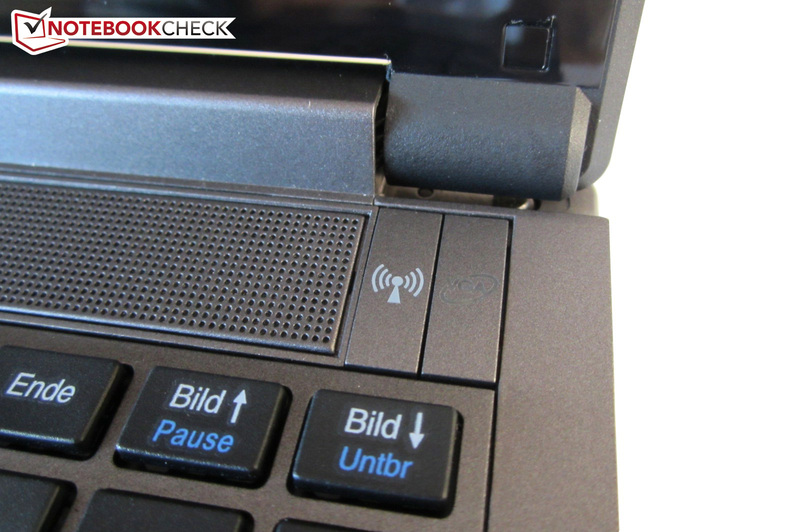 The manufacturer installed a convenient Wi-Fi button to enable and disable the Wi-Fi module. 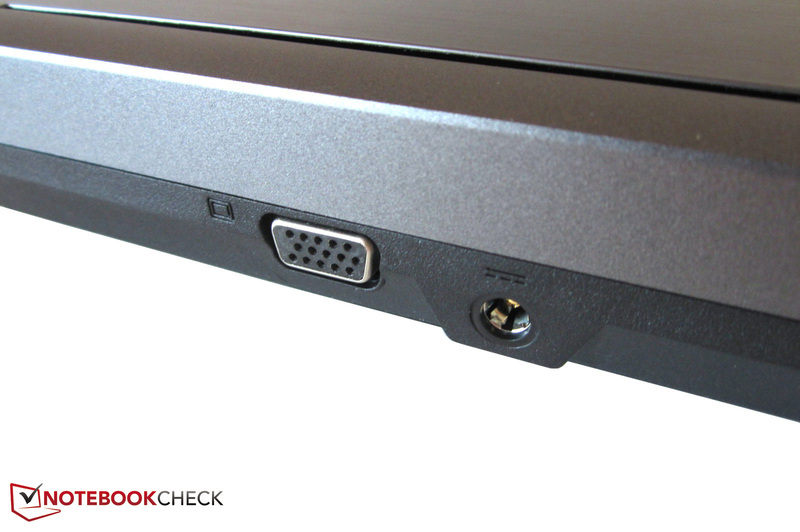 As well, a VGA button found above the right side of the keyboard prompts the system to use the integrated graphics card. Four LEDs below the XMG logo on the display bezel also deserve mention. These indicate the activity of Bluetooth, hard disks, and the GPU with green and orange indicating use of the Intel and Nvidia cards respectively. That said, we still would have appreciated a backlit keyboard for this notebook. 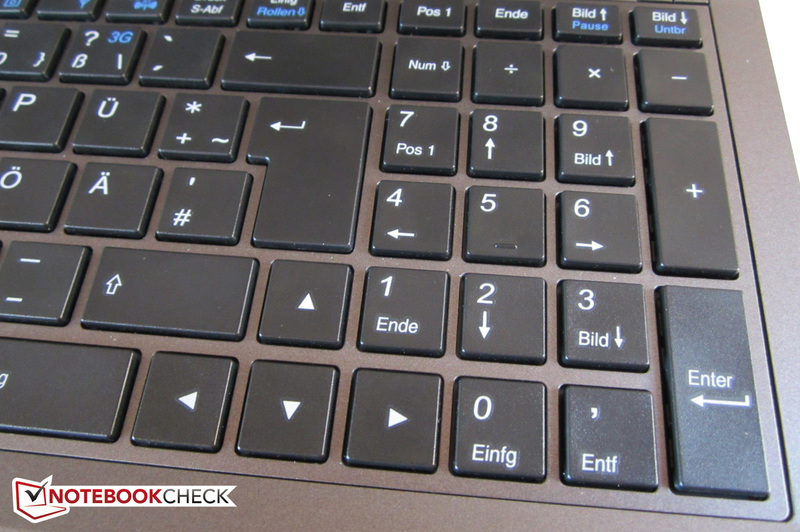 The Schenker XMG P502 offers an optional backlit keyboard. We were unimpressed by the XMG A522’s touchpad. The rubberized touch surface is very similar in both texture and appearance to the wrist rest and proved to be one of the touchpad’s biggest drawbacks. 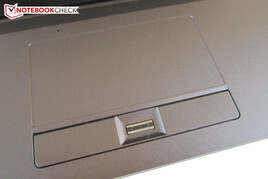 Without the touchpad’s recess into the base unit, navigation in the dark would be virtually impossible. However, the merely moderate gliding quality that results from the rubbery coating is more serious. The stickiness of the surface noticeably slowed down finger movement and also had an impact on accuracy. On the other hand, multi-touch functionality was favorable. Two- and three-finger gestures such as zoom, rotate, and scroll were easily performed. 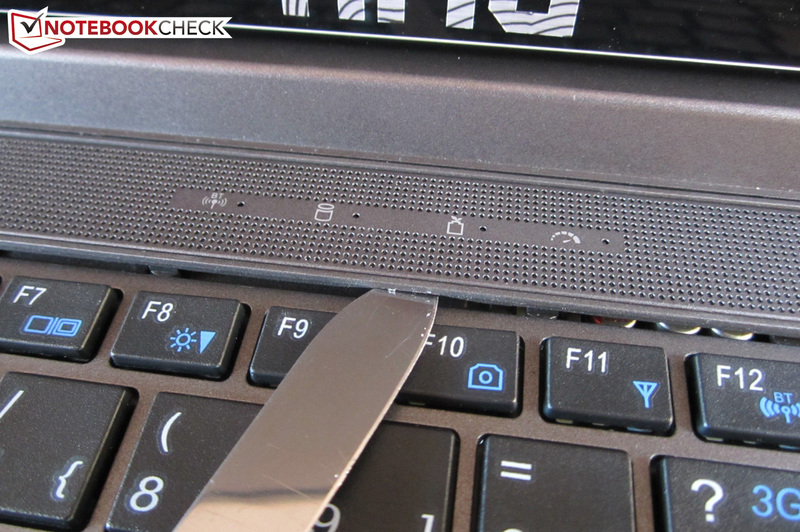 We were unable to find a classic scroll function on the edge of the touchpad in the driver. 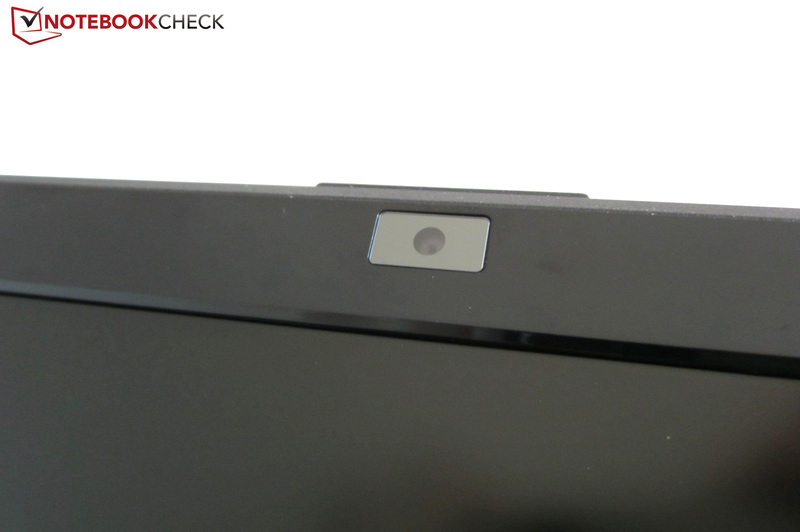 The 92 x 47 millimeter (3.6 x 1.9 inch) touchpad surface is also above average. 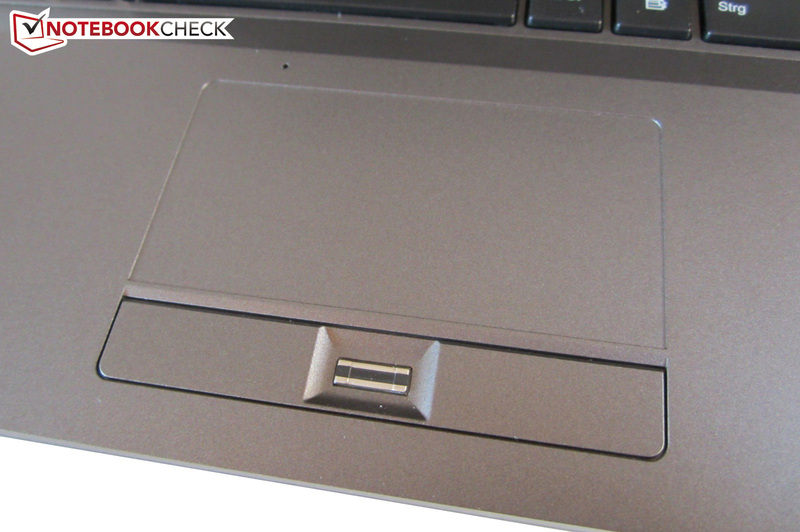 Due to its placement toward the right, the touchpad need not be disabled to avoid unintentional movement. 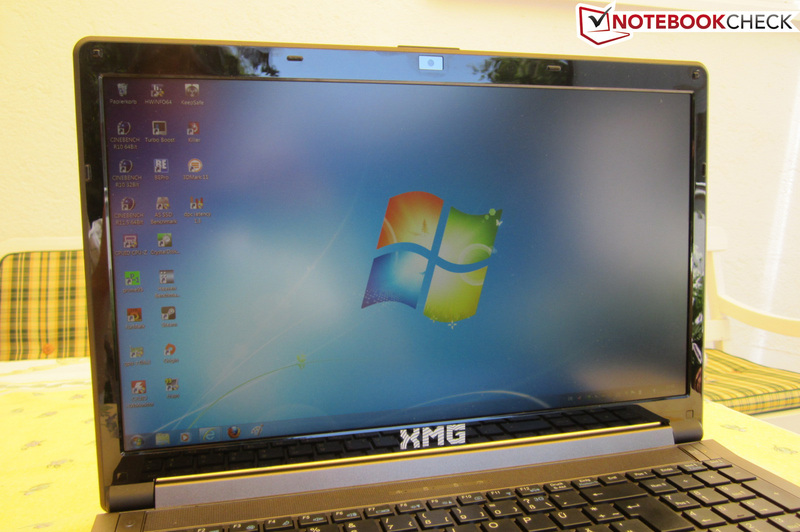 Our sample XMG A522 uses the optional Full HD screen. Regardless of the display model, the matte screen uses the 16:9 aspect ratio and a 39.6-centimeter (15.6-inch) diagonal. Unsurprisingly, the display is an LED-backlit TN display. Although the screen demonstrated an above-average picture quality, some aspects were clearly below those of the display in the W370ET. For example, the W350ET’s display brightness was only 240 cd/m2 as compared to the W370ET’s 260 cd/m2 brightness. The black value of 0.5 cd/m2 is also worse than the 0.3 cd/m2 black value found in the 17-inch model. This black value would be noticeable in dark game and movie scenes in a direct head-to-head comparison as higher black values lead to more grayish dark tones. As well, this black value leads to a diminished 540:1 contrast ratio when compared to the W370ET’s 855:1 ratio. Nonetheless, ordinary run-of-the-mill displays do not compare to the LG Philips screen used in the XMG A522. 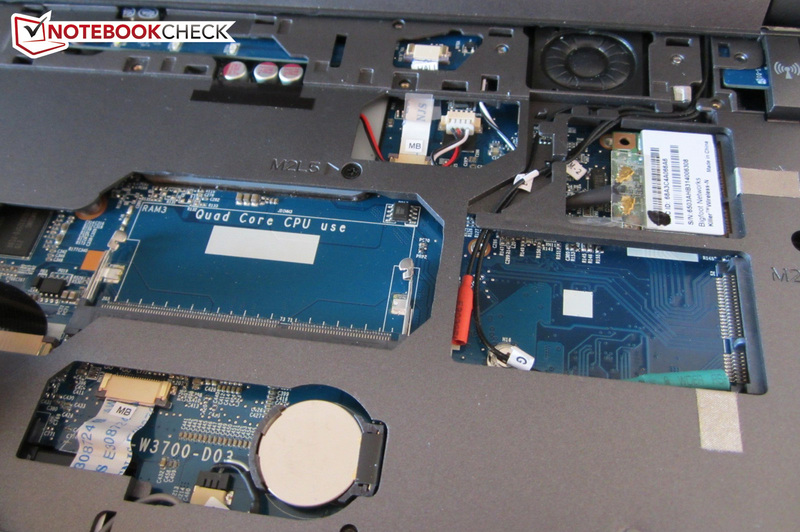 It is for this very reason that MSI often implements the LG Philips LP156WF1-TLF3 display in their barebones systems, used for notebooks such as the DevilTech Devil 6700. This display also has good sRGB coverage. It should be noted that Clevo tends to change screens every few months. As a result, our observations may not correspond to current retail models. At present, we do not have any detailed information regarding the standard 1600x900 HD+ display for the XMG A522. If the display’s overall brightness were better, we would likely praise a great outdoor suitability. Unsurprisingly, the screen’s matte surface is not nearly as reflective as glossy glare-type displays. As long as the sun did not directly shine on the screen, we were able to work well with the device outdoors. The brightness was also generally sufficient for indoor use. Glossy displays tend to reflect even under normal lighting. We found that the horizontal viewing angles give little room for complaint. Even when several people were gathered around the screen, everyone was able to see a decent picture. On the other hand, the screen should not be tilted toward the viewer as the slightest vertical viewing angle change heavily distorted the image. Currently, the XMG A522 is sold using only Ivy Bridge processors fabricated on a 22 nm process. These processors are identified by their Core i 3000-series model numbers. While the Ivy Bridge uses the integrated HD Graphics 4000 which is approximately 40 percent faster than the older HD Graphics 3000 used by Sandy Bridge processors, not much has changed in terms of pure CPU performance despite the use of 3D transistors. 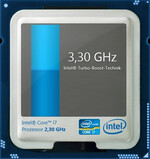 Ivy Bridge processors instead base their superior performance on their slightly higher clock rates. 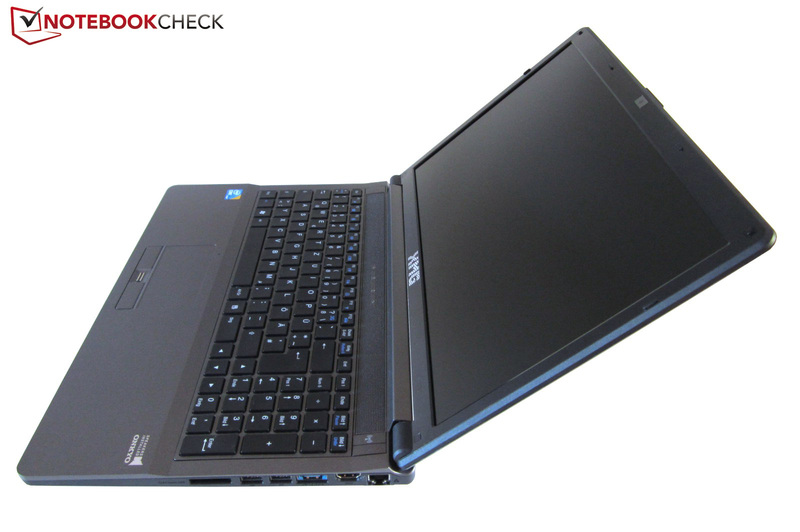 Our test notebook is powered by the very-popular Core i7-3610QM. This quad-core processor makes use of Hyper Threading technology to allow each core to simultaneously handle two threads. In this case, the processor is capable of eight parallel threads. The Turbo Boost 2.0 function is also present, allowing the processor to automatically overclock itself. 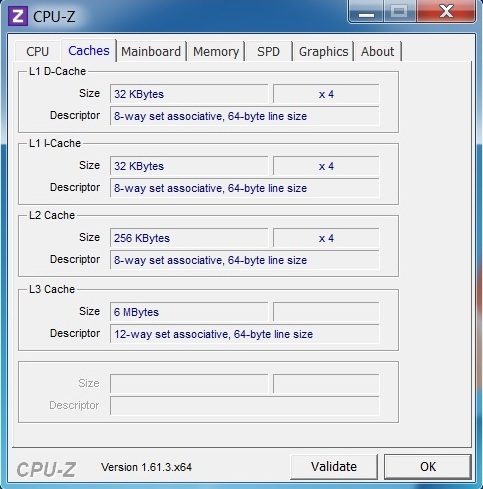 The 6 MB L3 cache is also considerably larger than the 3 MB cache found in Core i5 dual-core processors. It should also be noted that Sandy Bridge processors use slightly slower DDR3-1333 RAM as opposed to the DDR3-1600 used by Ivy Bridge processors. Clevo has historically received criticism for its implementation of a trimmed Turbo mode in which the processor was only capable of exploiting its dynamic overclocking feature when running alongside the integrated GPU. This was also the case in our test sample. The processor was easily capable of surpassing 3 GHz during load but the processor was generally limited to the base clock of 2.3 GHz when using the Nvidia GPU. 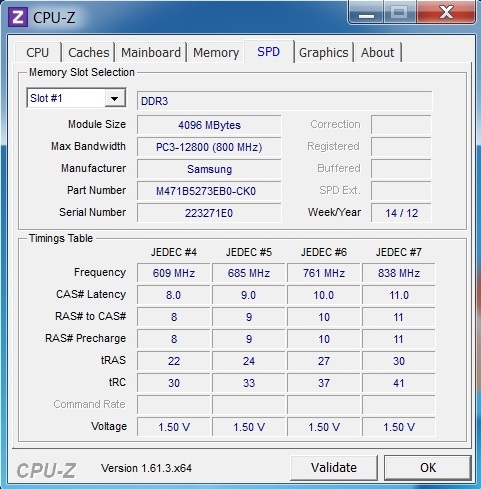 This severely reduces the standing of this processor at this point in 2012. While most games are more heavily dependent on graphics power, we still consider this decision to be suboptimal. Clevo apparently lacks faith in the device’s power supply and/or cooling. This trend was also observed in the W110ER-based Schenker XMG A102, W150ER/170ER-based Schenker XMG A502, and W370ET-based One K73-2O. The P150EM-based Schenker XMG P502 and P170EM-based Schenker XMG P702 are fortunately spared from this issue. In order to determine the best-case performance of the processor, we performed all CPU benchmarks without the GeForce graphics card. 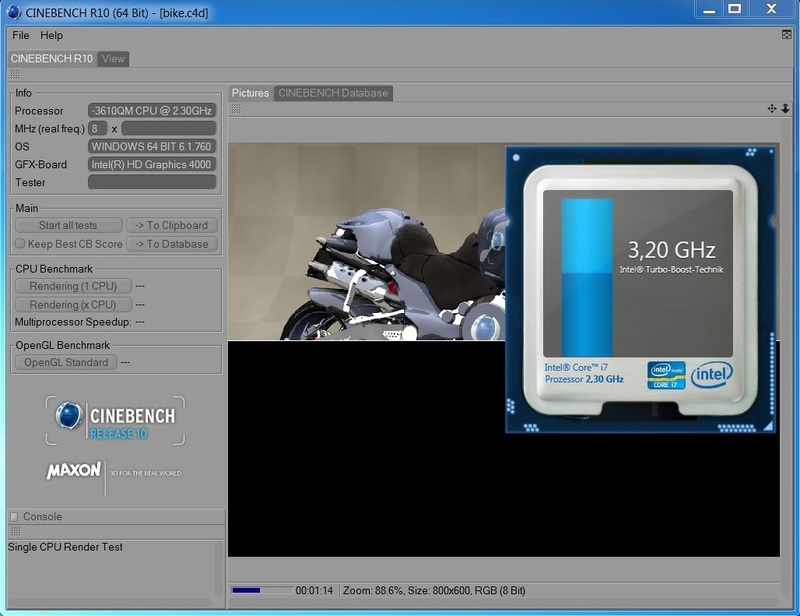 The Core i7-3610QM reached its typical performance level of 6.27 points in the Cinebench R11.5 multi-core test, demonstrating none of the “Turbo lock” issues previously mentioned. 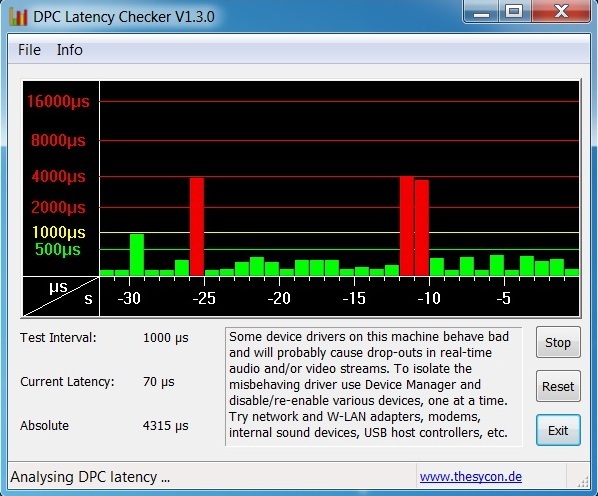 This result corresponds exactly to the results of the DevilTech Fire DTX and DevilTech Devil 6700. This result is clearly ahead of the currently most-powerful dual-core processor, the Core i7-3520M, which clearly lags behind with a score of 3.44 points in the One M73-2O. Nonetheless, dual-core processors are still worthy of consideration due to the higher overall clock rates. 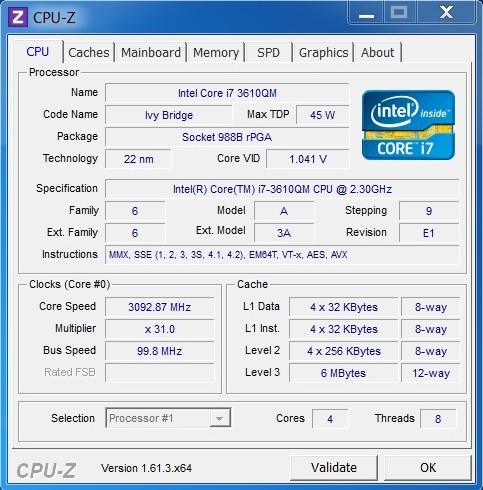 The Core i7-3720QM, currently 100 Euro (~ $122) more expensive, found in the Asus G75V only demonstrated an 8 percent lead over the i7-3610QM with 6.8 points in the same test. The Schenker XMG A522 uses the Nvidia GeForce GTX 660M based on the successful 28 nm Kepler architecture. 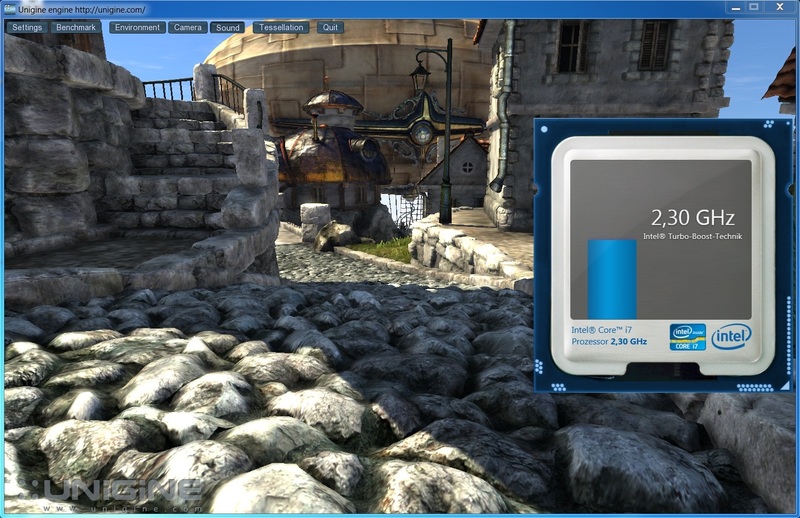 The GK107 chip features 384 shader units and is clearly not in the same league as the Nvidia GeForce GTX 680M (GK104) which features 1344 CUDA cores. The GTX 660M features a relatively lush 2048 MB GDDR5 video memory. This high-end graphics card is, however, limited by its 128-bit memory interface. By comparison, the GTX 680M uses 4096 MB GDDR5 VRAM on a 256-bit memory interface. In the XMG A522, the GTX 660M uses clock speeds of 835 MHz and 2500 MHz for the core clock and memory clock respectively, slightly higher than 720 and 1800 MHz clock speeds used in the GTX 680M. Nonetheless, the GTX 660M is a considerably slower card than Nvidia’s top-of-the-line model. Even though the GTX 660M has support for DirectX 11.1, it is still surpassed by both the Nvidia GeForce GTX 670M and Nvidia GeForce GTX 675M which are based on the older 40 nm Fermi architecture. The current Kepler architecture combines good performance with modest power consumption and is considerably more energy-efficient than Fermi architecture. As well, Kepler-based GPUs are capable of a long list of features that includes PhysX support for GPU-based physics calculations. The XMG A522 features Nvidia Optimus technology which allows the system to switch graphics cards based on the needs of the system. Windows tasks such as browsing the Internet, word processing, and watching movies can be handled by the integrated HD Graphics 4000, reducing power consumption considerably. 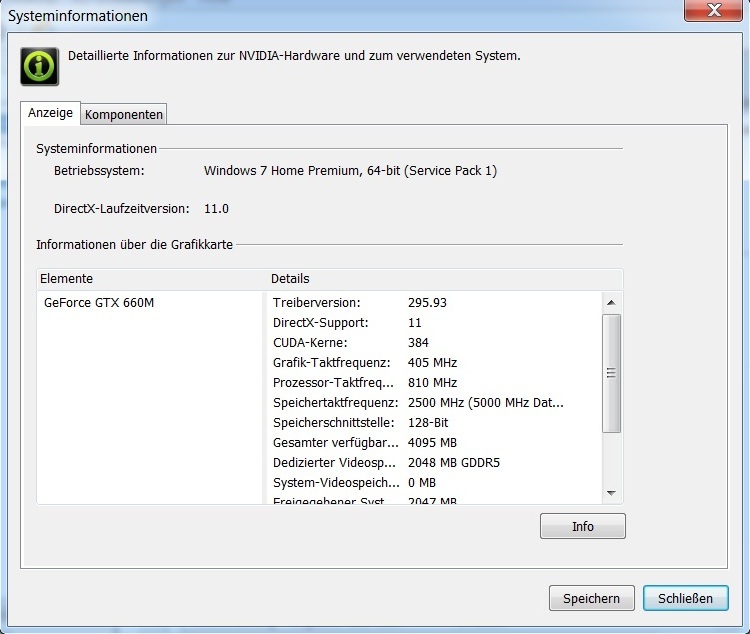 In our testing, we did not modify the pre-installed 295.93 Nvidia graphics driver. 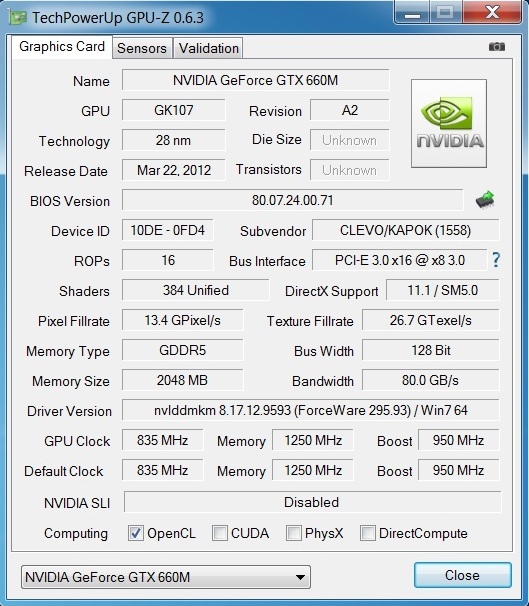 The GeForce GTX 660M includes a feature called GPU Boost. Like Intel’s Turbo Boost 2.0 technology, this feature allows the GPU’s core clock to increase significantly provided the cooling system is capable of handling the increased thermal emissions. 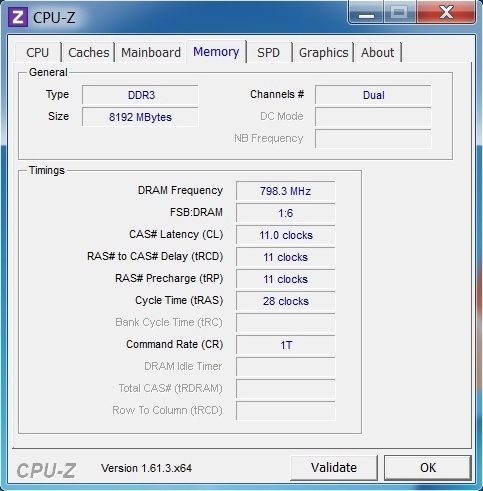 In our testing, we observed a 950 MHz core clock as opposed to the 835 MHz base clock. This 14 percent improvement demonstrates that Clevo has properly exploited this feature. While this boost may be more or less beneficial depending on the application, it is regrettable that the manufacturer limited the processor as previously mentioned. 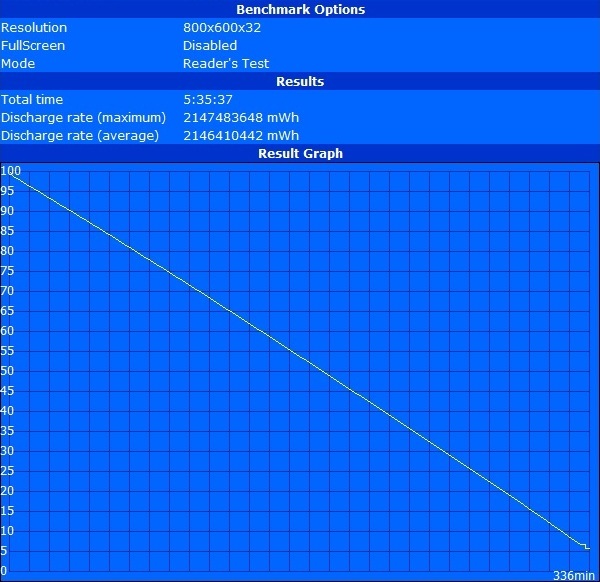 In our testing, we verified that the GeForce GTX 660M’s performance falls somewhere between the mid- and upper-range categories. For example, our GTX 660M achieved a GPU score of 2414 in 3DMark11 using the performance preset in the 1280x720 test. This places the GTX 660M 13 percent ahead of the Nvidia GeForce GT 650M, which scored 2130 points in the Alienware M14x R2, and 10 percent behind the Nvidia GeForce GTX 670M, which scored 2688 points in the Medion Erazer X6821. We observed similar differences in the Unigine Heaven benchmark where our test device achieved 33.4 fps using a 1280x1024 resolution and normal tessellation settings. By comparison, the GT 650M in the MSI GE70 managed 28.4 fps and the GTX 670M in the Asus G75VW was capable of 39.0 fps in the same test. 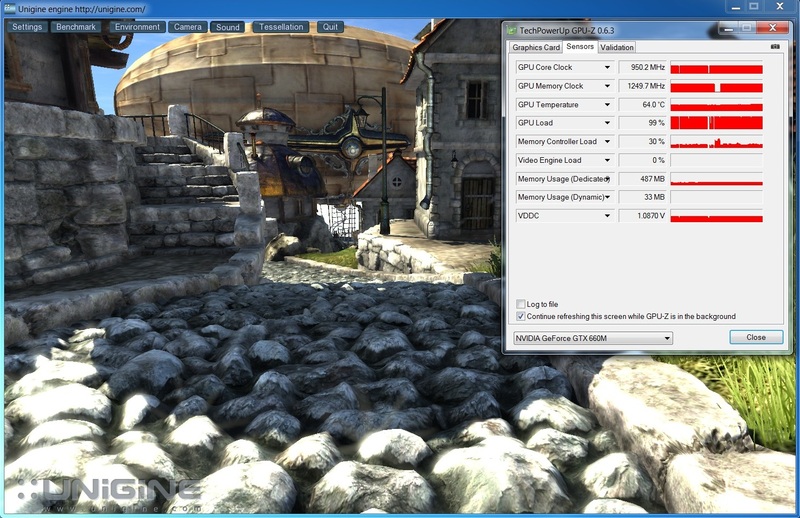 On the other hand, the Nvidia GeForce GTX 680M can easily laugh at such results with the Schenker XMG P702 PRO managing 6025 points and 74.2 fps in 3DMark11 and Unigine Heaven respectively. 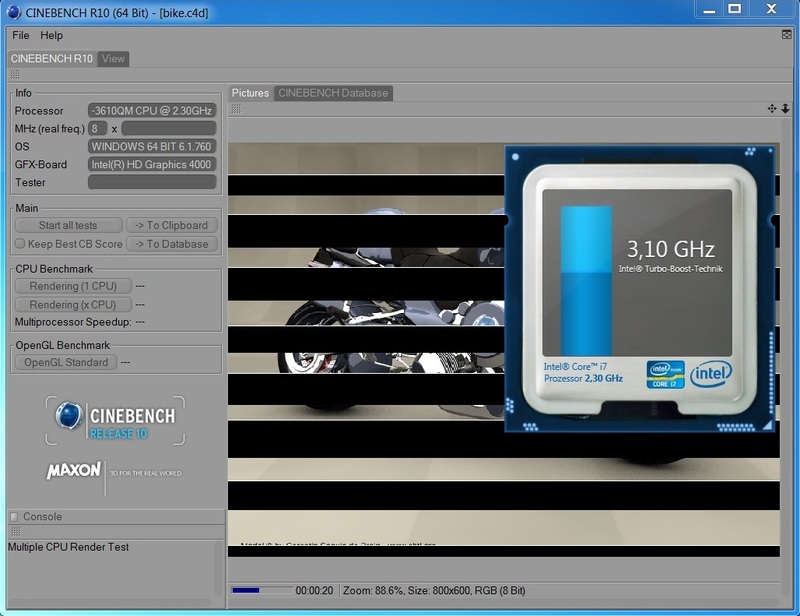 Currently, only the AMD Radeon HD 7970M comes close. 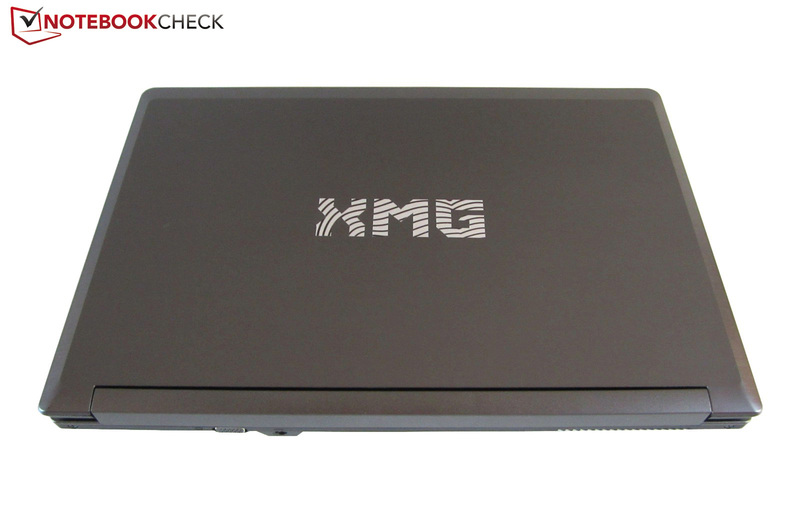 Our sample XMG A522 came with two hard drives – the 128 GB Samsung SSD 830 solid state drive and the 1 TB 5400 RPM SATA II Seagate Momentus ST1000LM024. We started our test scenario by analyzing the 7-millimeter (0.28-inch), 61-gram (0.13-pound) Samsung 830. This drive is built on 27 nm toggle DDR MLC NAND flash. According to the manufacturer, this SATA III model is capable of maximum read/write speeds of 520 MB/s and 320 MB/s respectively. 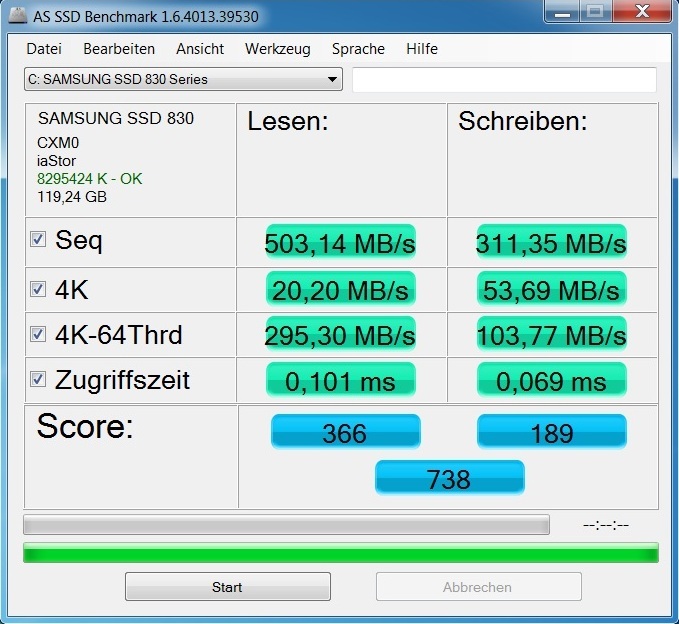 We observed a sequential read rate of 503 MB/s and sequential write rate of 311 MB/s in the AS SSD benchmark, confirming that Samsung was not exaggerating. 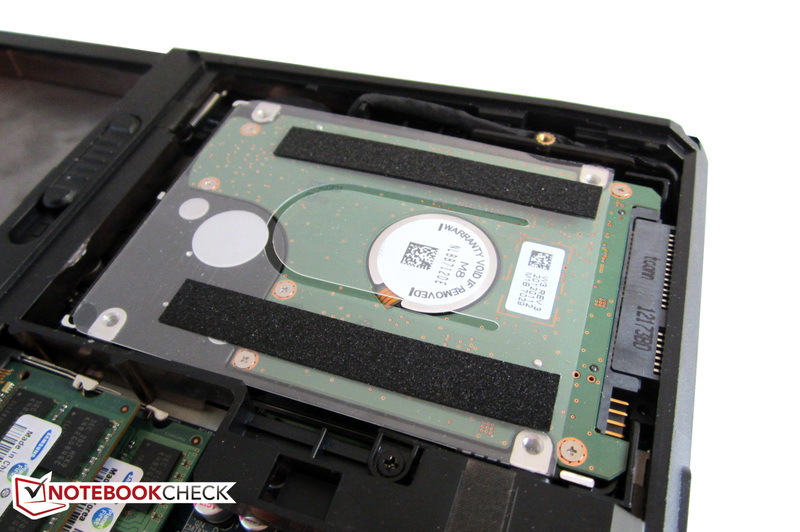 Other SATA III SSD models, such as the Intel SSD 330 and Crucial RealSSD M4 offered in Schenker’s online configurator, have comparable read rates of 475 to 490 MB/s. However, those drives also have much slower, sub-200 MB/s write speeds as measured in the Schenker XMG A102 and Gigabyte U2442N. 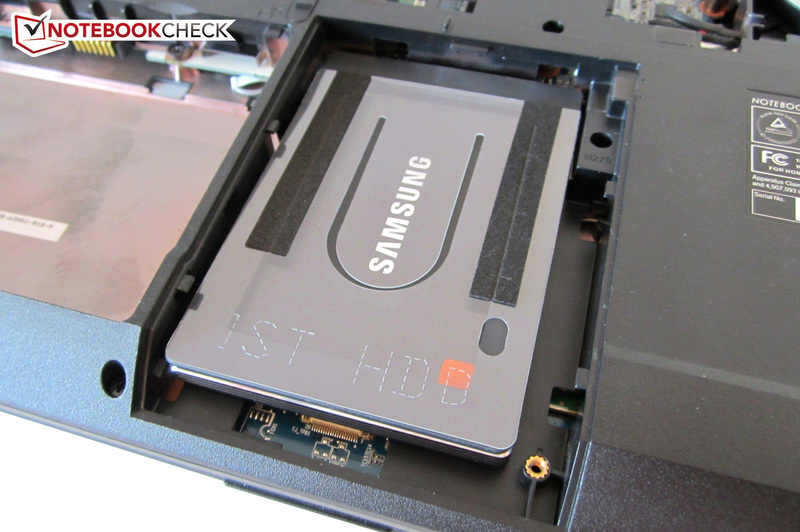 The Samsung 830 SSD also proved to be first-rate with smaller files. We observed great access times on the order of 0.1 ms and 0.07 ms for read and write respectively. On the other hand, we stored approximately 200 GB worth of game files on the secondary hard disk, the Seagate Momentus which features an 8 MB cache. Despite its leisurely 5400 RPM rotational speed, the 2.5-inch Momentus is quite capable of competing with some 7200 RPM models. 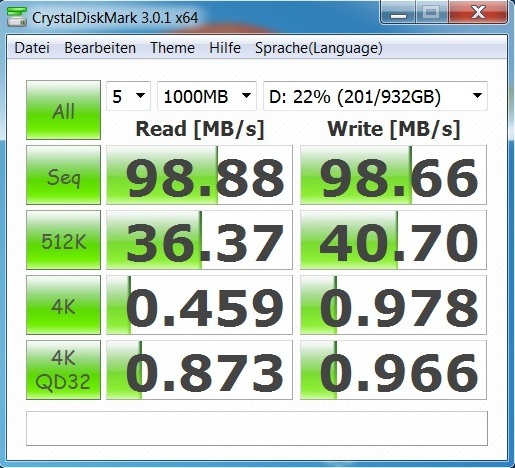 In CrystalDiskMark, the drive managed a relatively good result of 100 MB/s. 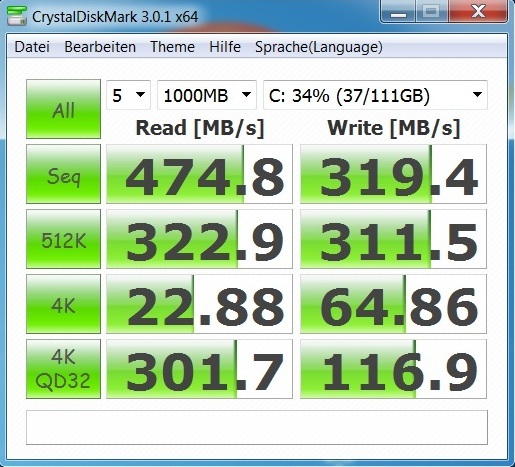 The Toshiba MQ01ABD100 1 TB 5400 RPM drive from the One K73-2O also managed a similar result. 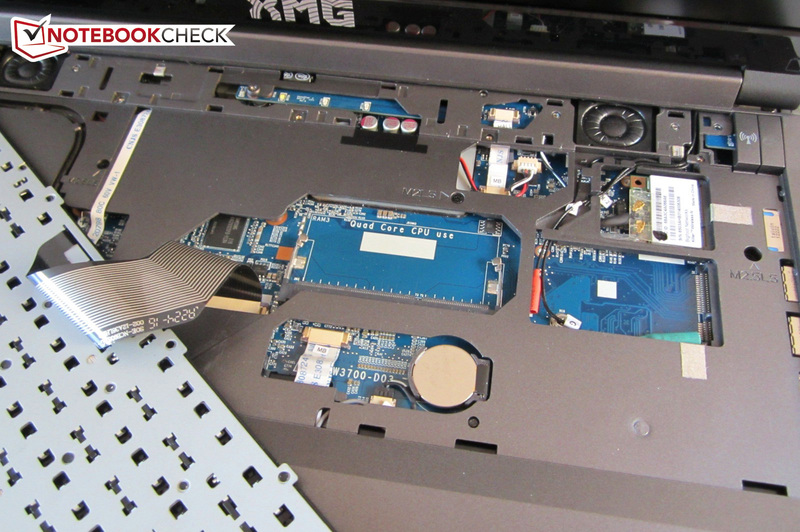 As a result of the fast SSD system drive, the XMG A522 also excelled in system benchmarks. The 19762 points scored by our test system in PCMark Vantage would not be possible without a solid state drive. At present, only a few devices, such as the Asus G75VW and Alienware M18x R2, are capable of breaking the 20000 point barrier. The XMG A522’s 3860 points in PCMark 7 are also quite good. 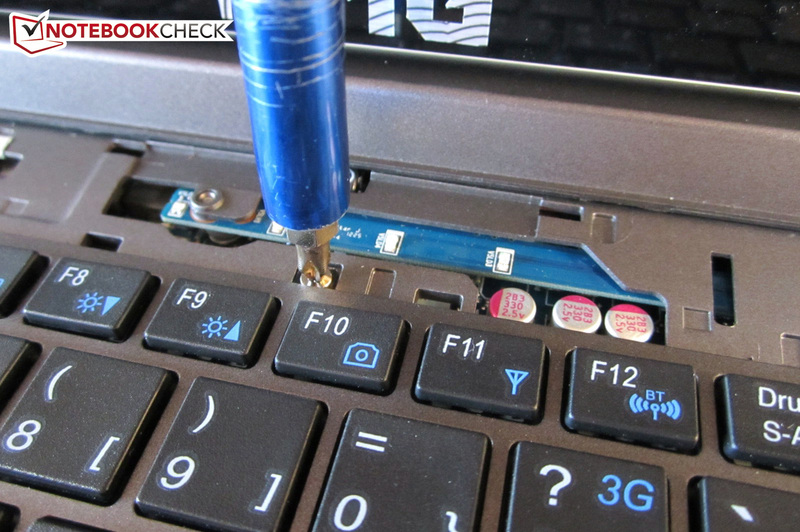 Ordinary, run-of-the-mill laptops are typically limited to approximately 2000 points in this test. 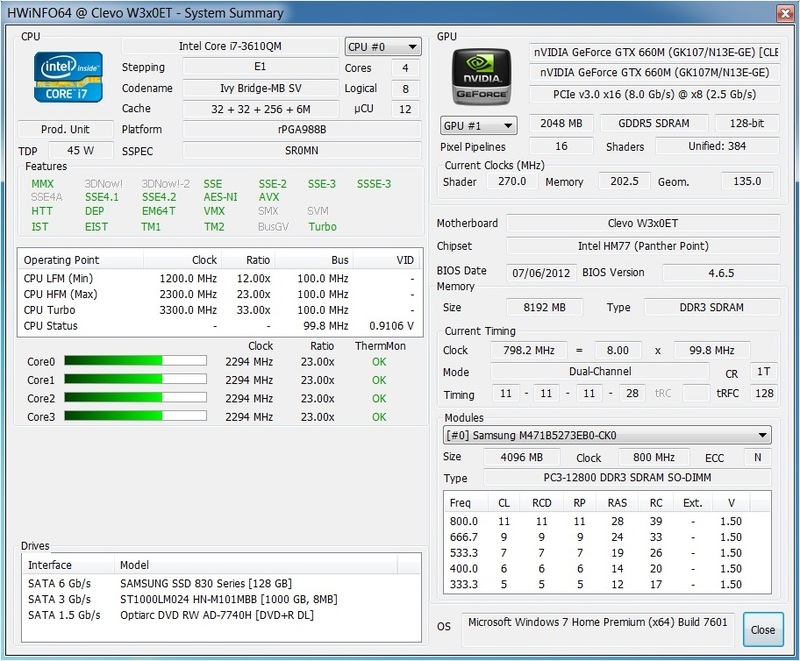 The XMG A522’s Geforce GTX 660M demonstrates its limitations in demanding PC games. When using the native 1920x1080 resolution and maximum settings, a few games such as Battlefield 3, Dirt Showdown and Anno 2070 stuttered intensely. However, other popular mainstream games such as Call of Duty: Modern Warfare 3, Mass Effect 3, and Diablo III ran well at high settings. This DirectX 11 GPU is better suited for a 1600x900 resolution. For those desiring to always use the display’s native resolution, it might be worth considering the cheaper HD+ screen. 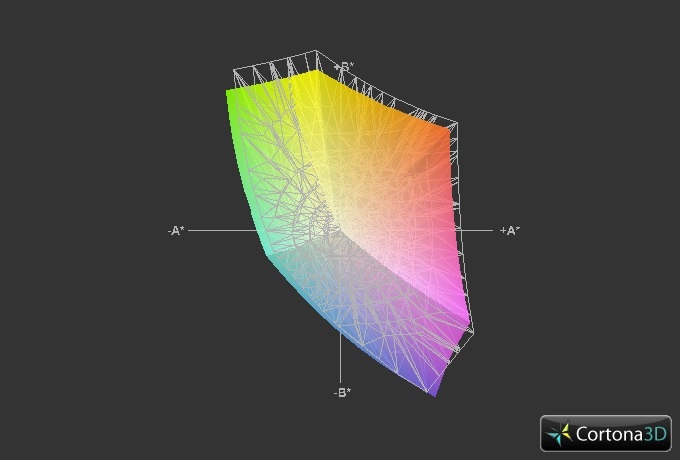 While the Full HD screen can support numerous 4:3, 16:9, and 16:10 resolutions including the 1600x900 resolution, doing so leads to a certain degree of blurriness as a result of rescaling. When only considering the highest or Ultra settings, the disabled CPU turbo had little or no effect on performance. The benchmark results were on par with other notebooks which also use the GeForce GTX 660M, such as the Asus G55VW and Lenovo IdeaPad Y580. On the other hand, reducing the settings revealed the effects of the disabled CPU turbo as the Gigabyte P2542G played The Secret World at nearly 7 percent higher fps in high details at a resolution of 1366x768. The XMG A522’s system noise left mixed feelings. 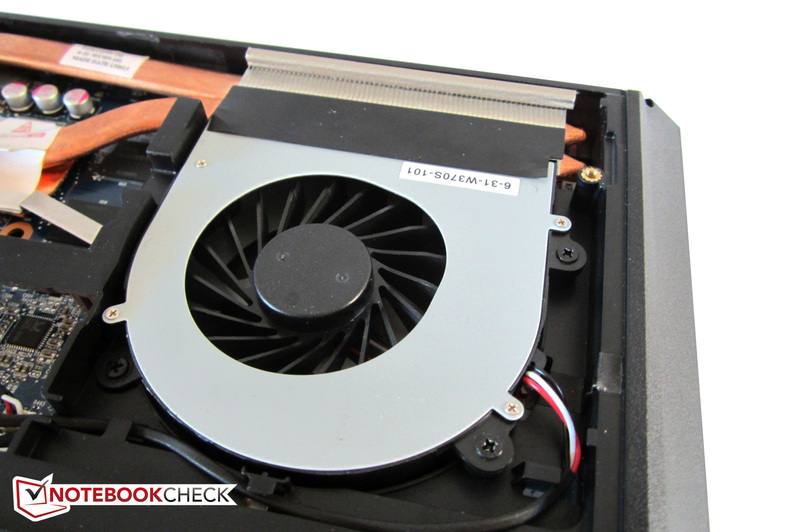 While idle, the primary source of noise was the physical hard drive which generated a quiet, non-annoying noise. After a period of inactivity, this drive went into sleep mode and the only detectable sound was the fan’s subtle noise. We also did not observe any adverse noise from the optical drive which remained restrained when playing a movie. 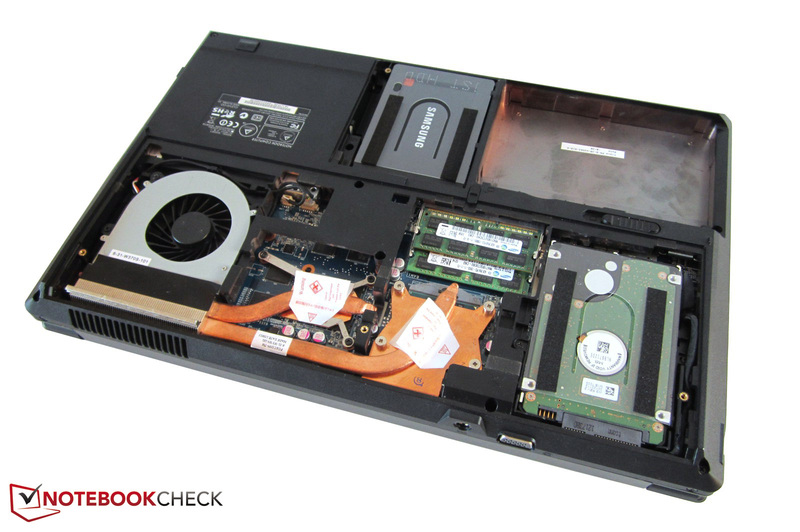 As is typical for gaming notebooks, the noise level increased dramatically when the notebook was under load. Sometimes the fan noise came to the fore front depending on the game genre and scene. While this may not warrant a return for most users, those particularly picky or sensitive to noise should consider an alternative option. 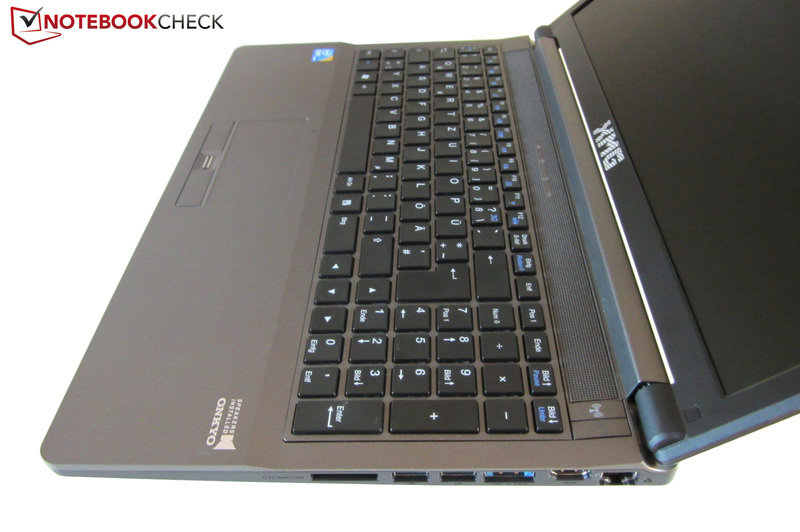 For example, the Asus G55VW is currently one of the quietest high-end notebooks. We observed a maximum 49 dB(A) noise level in highly unrealistic full-load operation. The 17-inch version also reached a comparable noise level in the same scenario. During our testing, we found that one of the XMG A522’s few weaknesses is its fairly high temperature emissions. While our test was conducted on a hot summer day and our ambient testing temperature of 28°C (82°F) was hardly ideal, the system temperatures we measured are nonetheless above average. We measured an idle temperature of 34°C (93°F) for the base unit. During our stress test, we measured temperatures of 38°C (100°F) and 41°C (106°F) for the top and underside of the base unit respectively. We even measured a temperature of nearly 50°C (122°F) above the keyboard. However this should not prove to be a major limitation as the wrist rest and WASD key areas remained within an acceptable range with measured temperatures of 32°C (90°F) and 36°C (97°C) respectively. The internal components made a contrasting impression. The graphics card did not surpass 76°C (169°F) even after an hour of full load in our Furmark/Prime stress test. 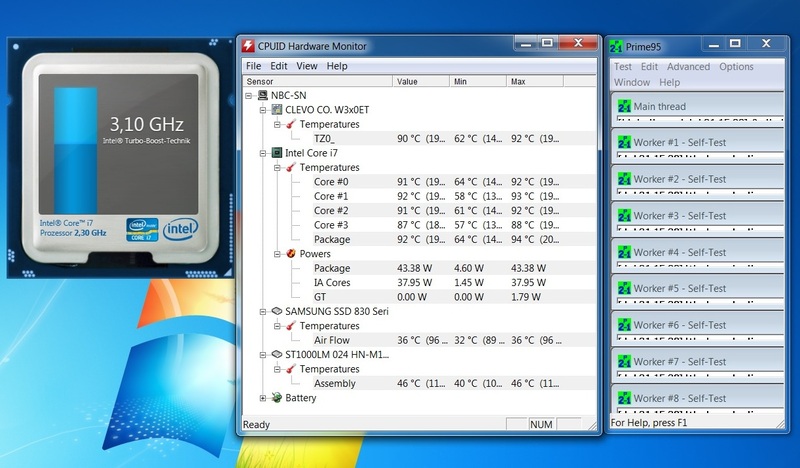 On the other hand, the CPU reached nearly 90°C (194°F) and throttled to 1.2 GHz. 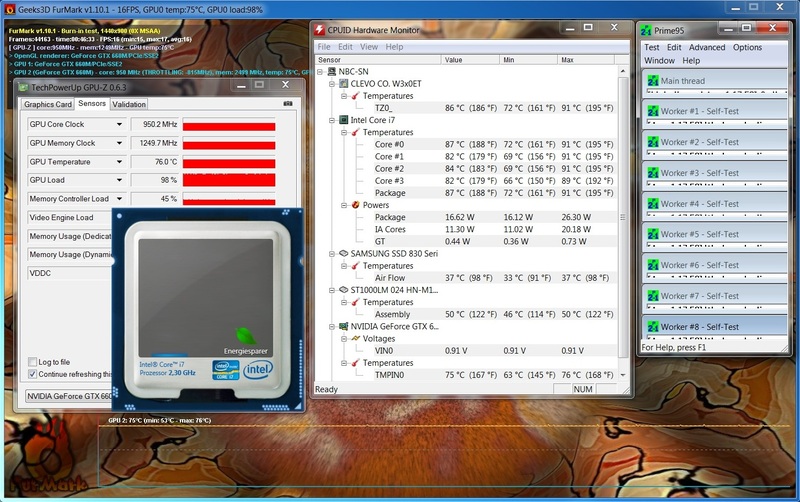 By comparison, the W370ET’s Core i7-3610QM remained approximately 10°C (18°F) cooler during its test with a 24°C (75°F) ambient temperature. (±) In idle usage, the average temperature for the upper side is 34.4 °C / 94 F, compared to the device average of 32.9 °C / 91 F.
In our testing, we found the modest sound of the XMG A522 to be its largest drawback. 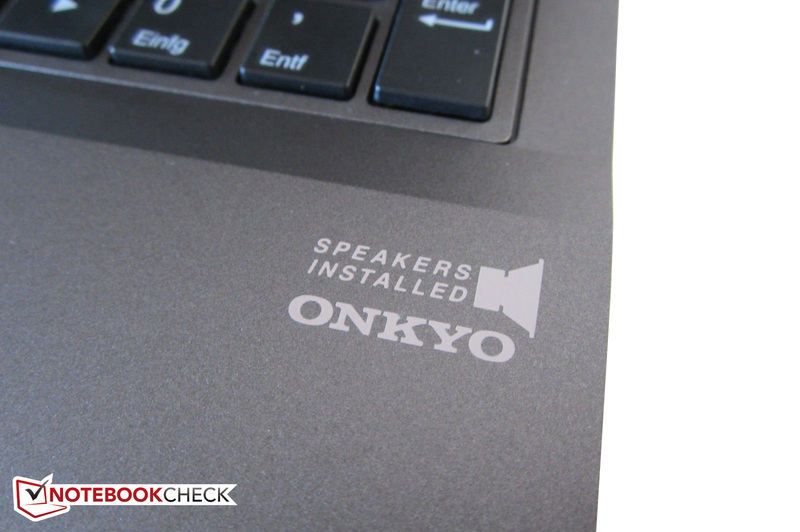 While the THX-certified Onkyo speakers look good on paper, Clevo has not accomplished adequate sound quality with this implementation. All types of media sounded tinny and artificial. There was hardly any bass and the overall sound precision was unsatisfactory. 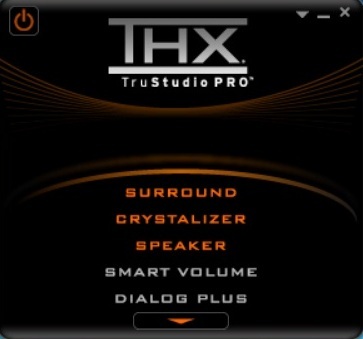 These are traits that the good maximum volume and TruStudio Pro software could not overcome. 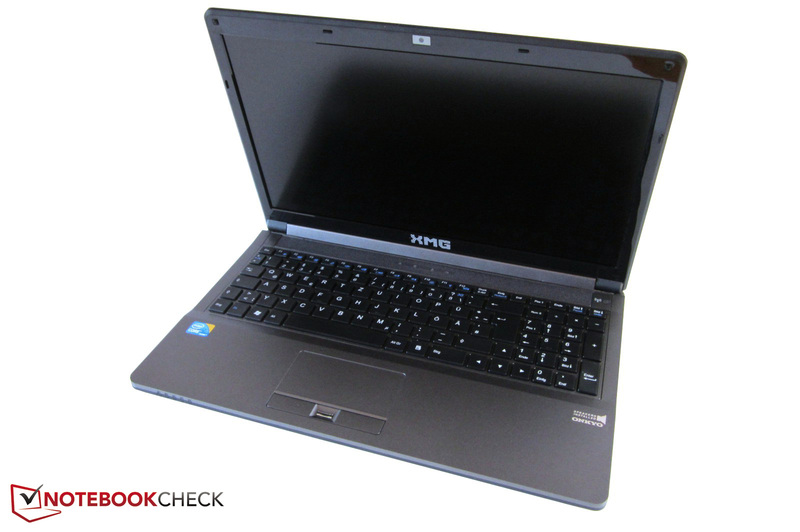 Other gaming notebooks, such as the Alienware M17x R4 and MSI GT70 are significantly superior to the XMG A522. As the W350ET barebones system’s sound is only average, one should consider using headphones or external speakers. In terms of power consumption, Nvidia Optimus was quite noticeable. 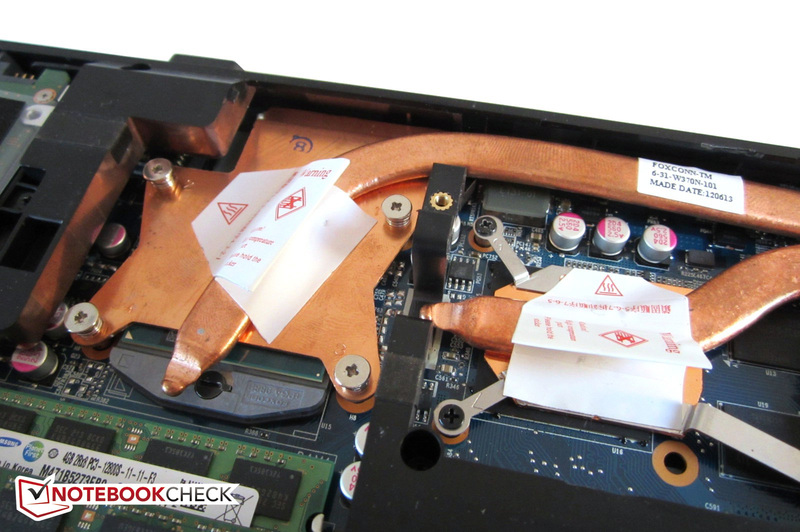 While high-end notebooks typically consume over 30 Watts while idle, the XMG A522 consumed only 12 to 20 Watts. By comparison, the One K73-2O consumed 14 to 25 Watts in the same scenario. The XMG A522’s load consumption was also lower than other GTX 660M devices due to the disabled CPU Turbo Boost. In 3DMark06, the XMG A522 consumed only 76 Watts as compared to the 96 Watts consumed by both the Asus G55VW and Gigabyte P2542G, both of which also have brighter screens. Our stress test consumed a maximum of 118 Watts. The lower power consumption resulted in an impressive battery runtime. The large capacity 77 Wh 8-cell battery was able to power the device for 5.5 hours when the display brightness was reduced to minimum in the Battery Eater Reader’s test. However, in our Wi-Fi test, where our display brightness was set to level 4 of 8 representing approximately 150 cd/m2, the notebook managed a more realistic 4.5 hours. This result is of course well short of the runtimes achieved by more efficient notebooks. DVD playback was possible for nearly 3.5 hours using maximum brightness so almost all movies can be watched without interruption. 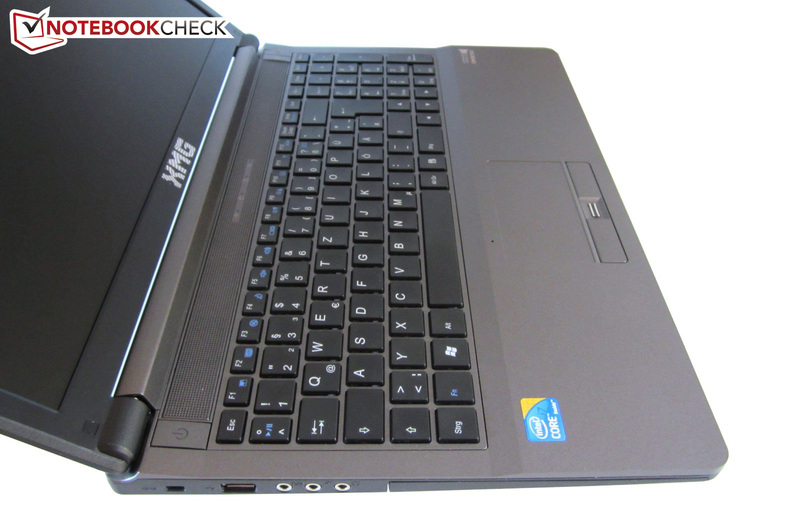 Under higher loads and using the dedicated GeForce GTX 660M card, the 15-inch notebook impressed us. Most comparable devices are unable to achieve the XMG A522’s two-hour result in the Battery Eater Classic test. By comparison, the W370ET was drained half-an-hour quicker. 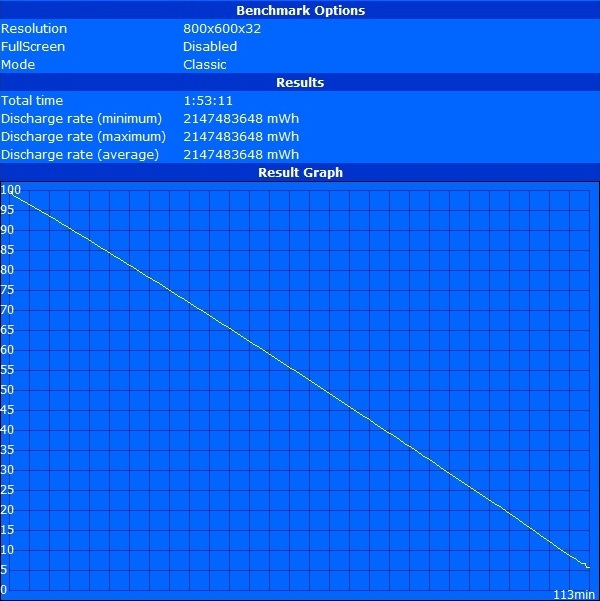 In a test using Unigine Heaven, performance on battery power was equal to performance on AC power. 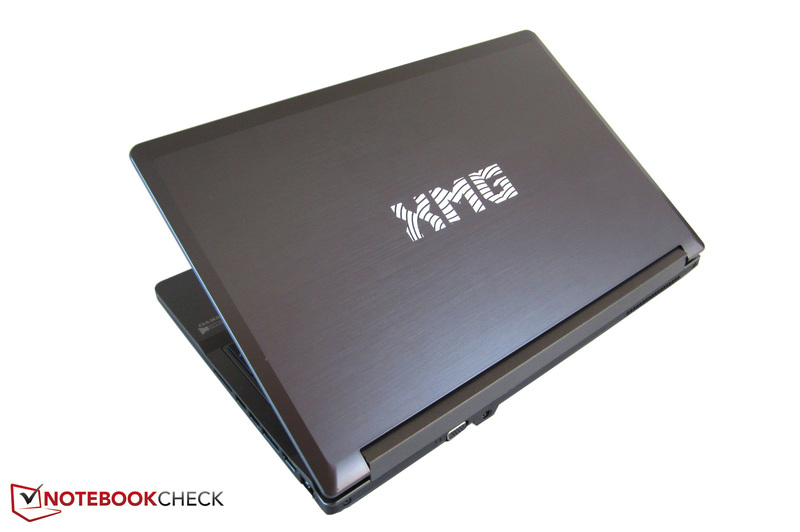 With the XMG A522, Schenker has created the perfect complement to its existing notebook portfolio. The 15-inch gaming notebook scored very well in most categories. 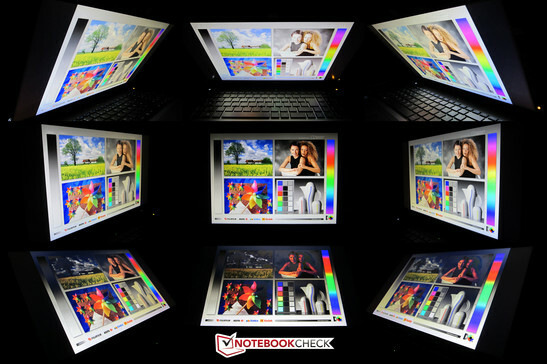 The matte Full HD display is, among other things, one of the strengths of this notebook. While the LG Philips LP156WF1-TLF3 is not the penultimate display option, its picture quality was thoroughly convincing in our tests. Similarly, performance was an area largely free from criticism. With the proper configuration, such as including a quad-core processor and solid state drive, the notebook can be a rather powerful, versatile, and largely future-proof package. Users who are not obsessed with playing the newest games in Full HD and maximum settings will also be happy with the GeForce GTX 660M. 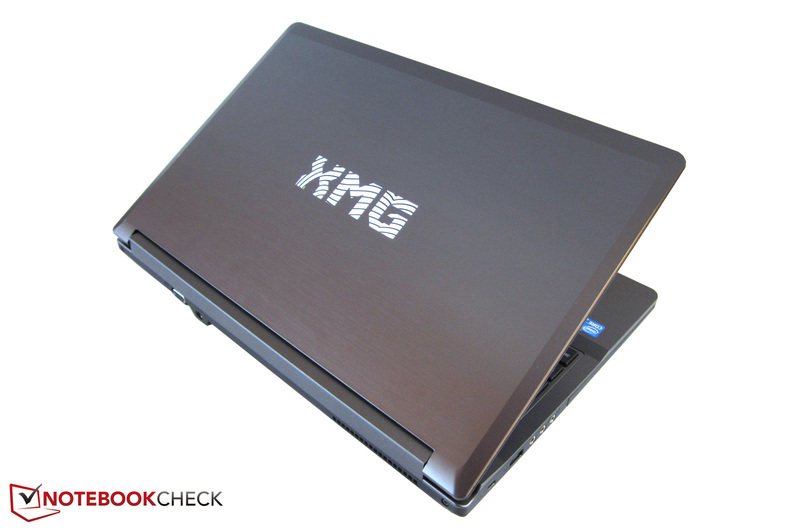 The XMG A522 demonstrated surprising energy-efficiency for a gaming notebook due to the mix of Nvidia Kepler architecture and Optimus technology. This efficiency ensures moderate power consumption and a relatively good battery runtime. 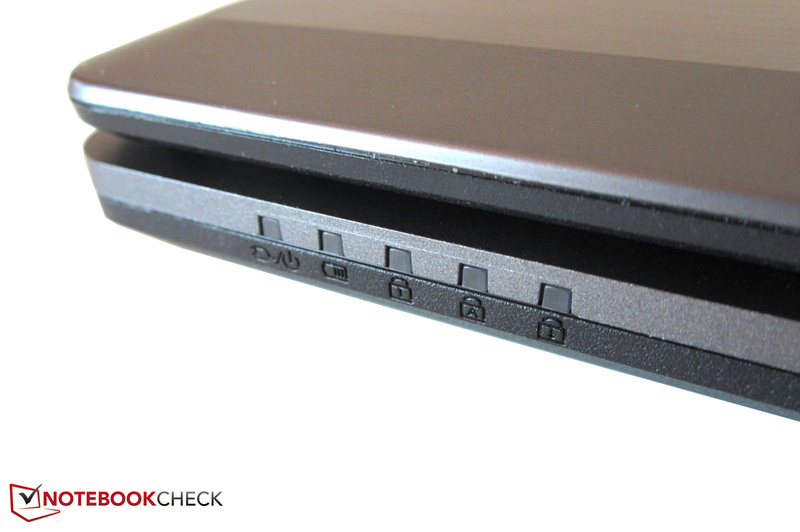 The underlying Clevo W350ET barebones system exhibited a number of strengths and weaknesses. In addition to the easy maintenance accessibility, we particularly liked the good connectivity, such as the three USB 3.0 ports, and the unobtrusive design. However, the emissions were not as good. The XMG A522 not only became warm during load; it also became fairly loud as is often the case from high-end notebooks. Moreover, the otherwise-pleasant input devices suffer from the lack of a keyboard backlight and sticky touchpad surface. We found it inconceivable why Clevo has retained the same stagnant philosophy in terms of system audio for years. The manufacturer should also discontinue the use of scratch-sensitive display bezels. Additionally, the disabling of Intel Turbo Boost while using the Nvidia GPU was odd. Schenker’s extensive configurator and the system’s clean Windows installation are strengths that unfortunately do not overcome these traits. Despite these listed shortcomings, the XMG A522 is worthy of consideration. 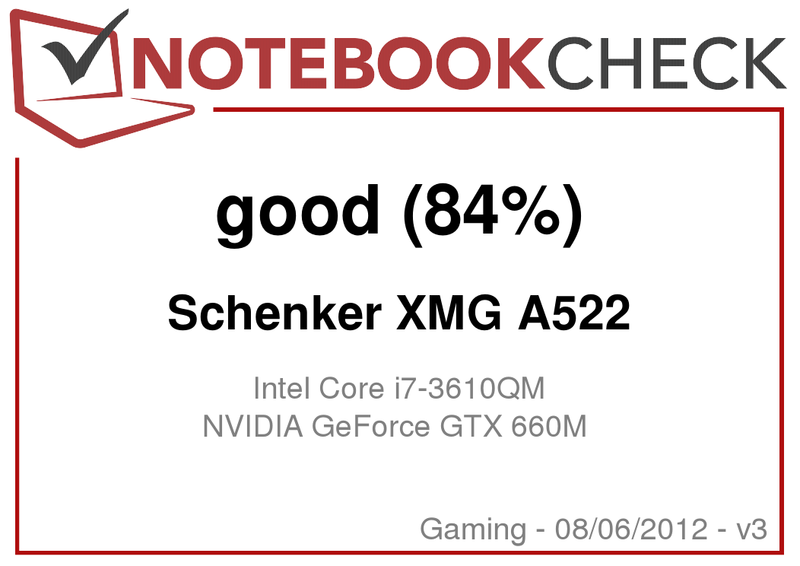 With a score of 84 percent, the 15-inch entry-level gaming notebook placed itself between the Schenker XMG A502 mid-range model and Schenker XMG P502 high-end model which scored 82 and 86 percent respectively. A review of the larger XMG A722 will be published shortly. The A522 marks the gaming category's entry-level. 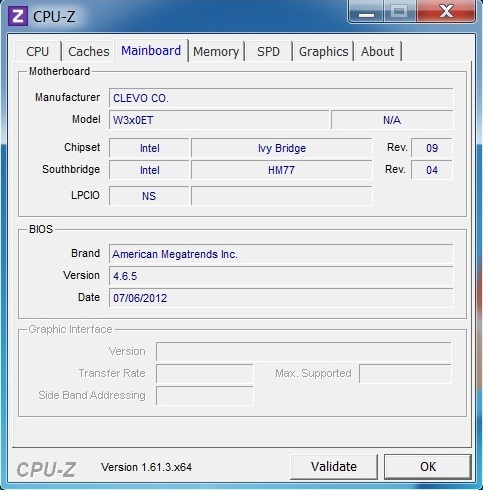 The third RAM bank can only be used with quad-core CPUs. A solid state drive speeds up Windows operations considerably. 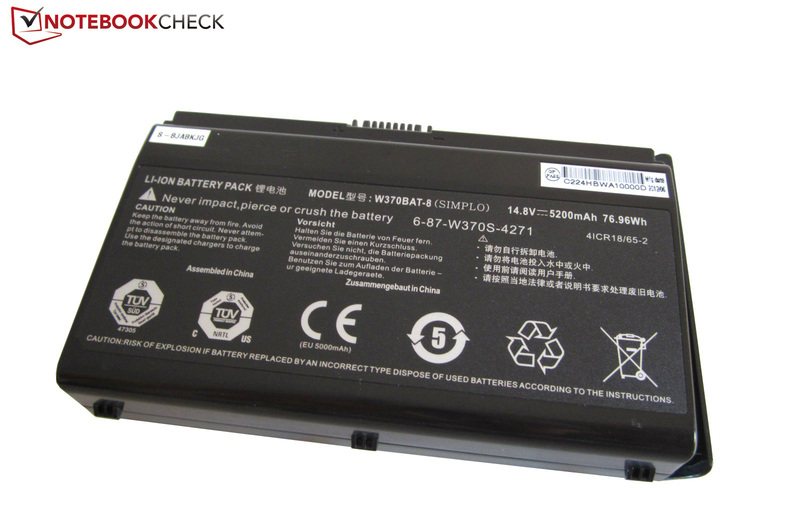 The 8-cell battery is the same as in the W370ET. The HD webcam is no surprise. Both status LEDs on the right indicate GPU activity. One arrow key is in the number pad. Wi-Fi can be disabled and enabled using a button. The sound is rather poor despite Onkyo speakers. The chiclet keyboard lacks a backlight. The layout does not give much reason for complaint. A fingerprint scanner sits between the mouse keys. Audio jacks for headphones, microphone, and S/PDIF. Even more status LEDs are in the front area. 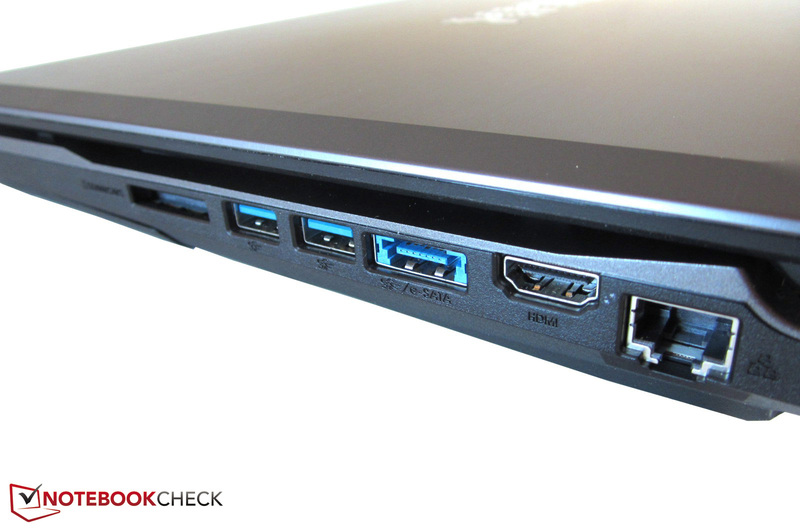 Three USB 3.0 ports earn kudos. The rear only features two interfaces. Few users need more than 8 GB of memory. Left: the exchangeable CPU. Right: the soldered GPU. Two 2.5-inch slots wait under the hood. A black and gray surface. The plastic lid looks like brushed aluminum. The bottom looks well arranged. In contrast to the XMG A722, the display bezel is glossy. We deem a thickness of 44 mm (1.7 in) acceptable. 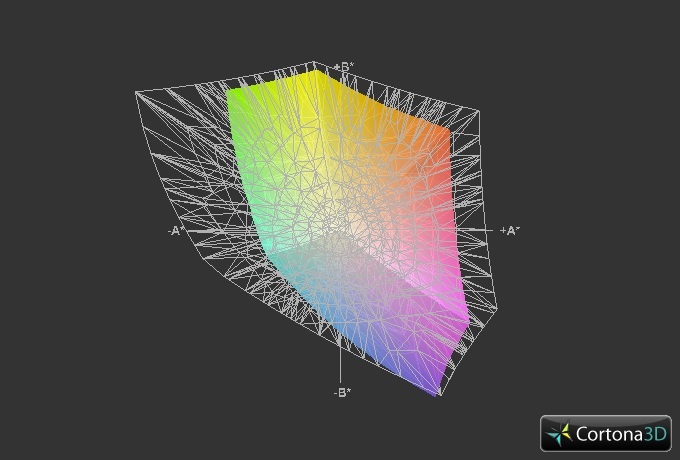 The maximum opening angle is approximately 135°. 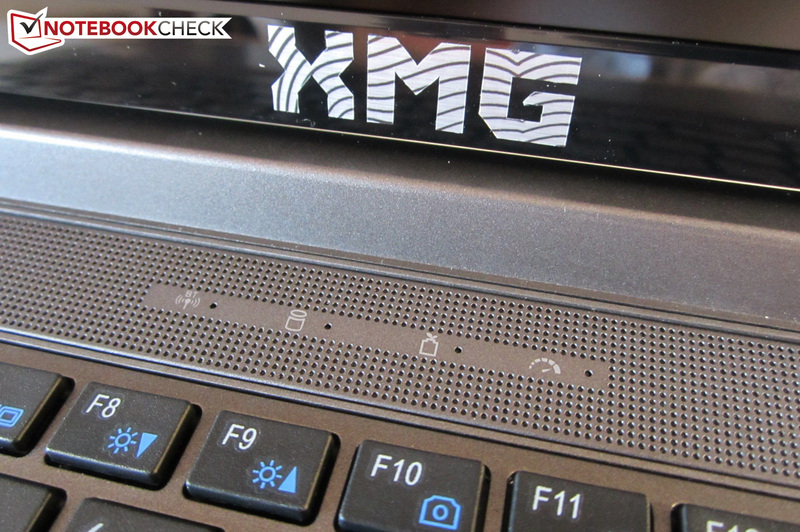 The XMG logo consists of three stickers. The notebook's quality is in the upper mid-range. 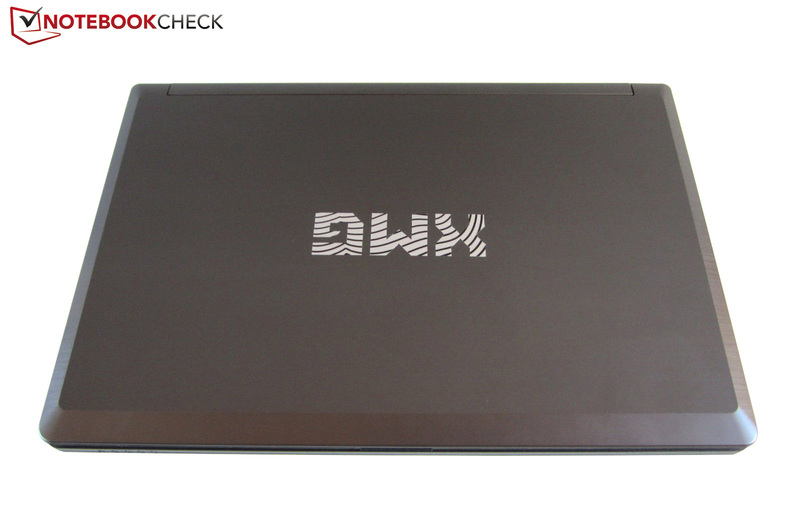 The 15-inch notebook offers good workmanship. Clevo's barebones are known for their user-friendly build. The base unit's stiffness is good. 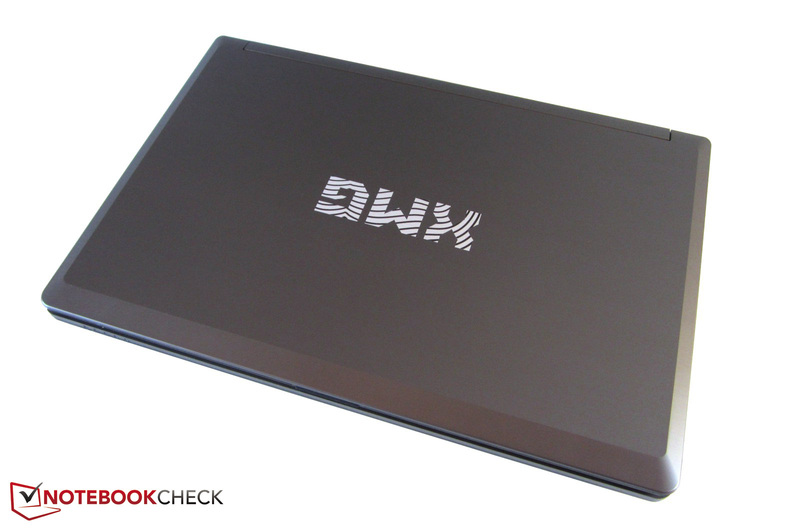 The notebook including battery weighs almost 2.8 kilograms (6.2 pounds). The manufacturer does not experiment with the design too much. The wrist rest features a light rubber coating. The components cannot be accessed without a screwdriver. The competition could learn from these extensive maintenance options. The 120-Watt PSU is not exactly fragile. The combination of great performance and good battery life. The matte Full HD screen and the extensive maintenance options are also convincing. A keyboard light, better speakers, and a matte display bezel are at the very top of our wish list. We would also like to have a non-rubberized touchpad. That the CPU's Turbo is disabled in gaming operation. Clevo's decision is highly dubious. 15-inch multimedia or high-end notebooks with a powerful graphics card such as the Asus N56VZ (GT 650M), Asus G55VW (GTX 660M), DevilTech 6700 (GTX 670M to GTX 680M), DevilTech Fire DTX (GT650), Gigabyte P2542 (GTX 660M), Lenovo IdeaPad Y580 (GTX 660M), MSI GE60 (GT 650 to GTX 660M), MSI GT60 (GTX 670M), Medion Erazer X6821 (GTX 670M), Samsung 550P7C (GT 650M), Schenker XMG A502 (GT 650M), and Schenker XMG P502 (GTX 660M to GTX 680M / HD 7970M).